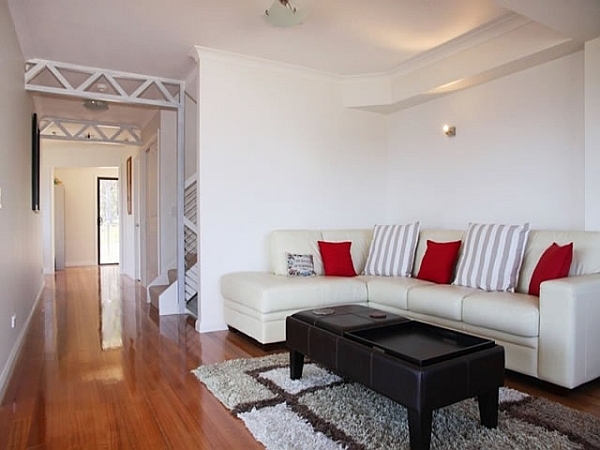 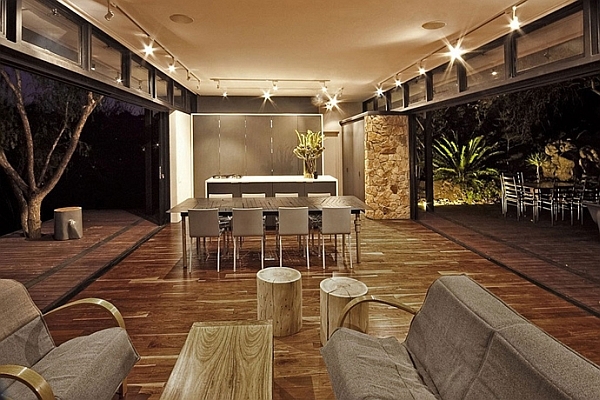 When it comes to the housing sector, the trend is to think beyond the mundane and the usual. 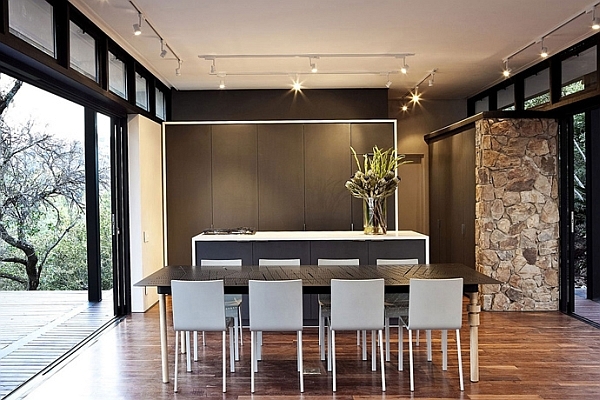 The last few years have seen a distinct shift from the expansive and the opulent to the minimal and the understated. 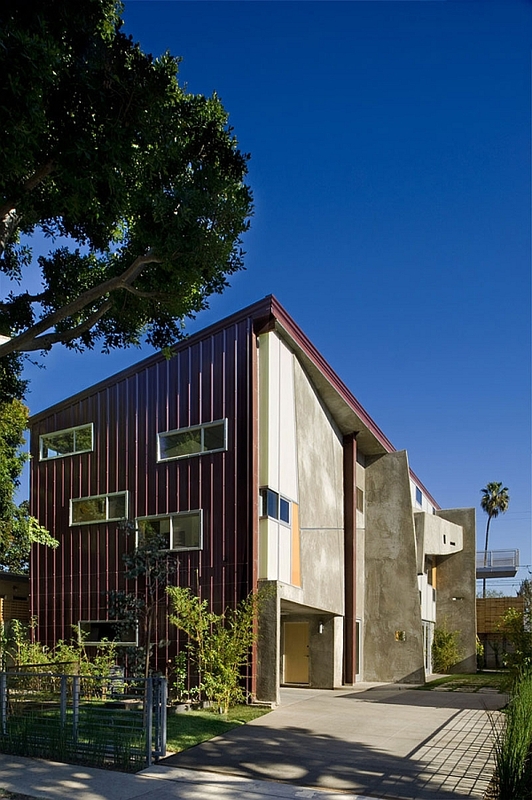 Homeowners are now happy to move away from lavish residences in urban centers to more modest homes in semi-urban locations. 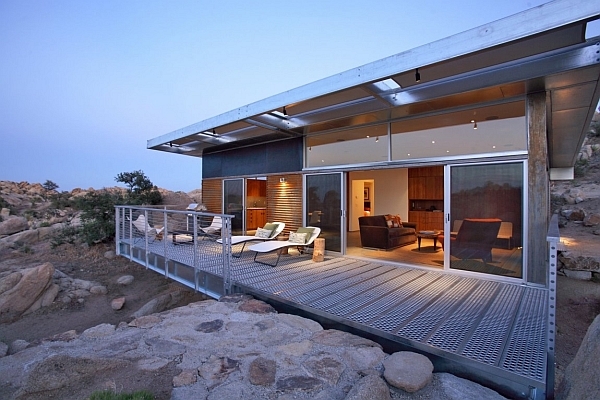 Stylish, sleek, lightweight and adaptable metallic structure homes fit this billing perfectly. 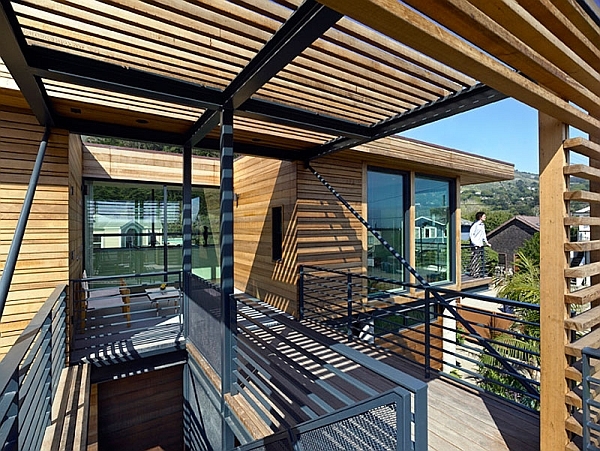 Constructed using a sturdy steel frame, these smart homes are quickly becoming a popular choice among those looking for efficient, eco-friendly and economically viable alternatives. 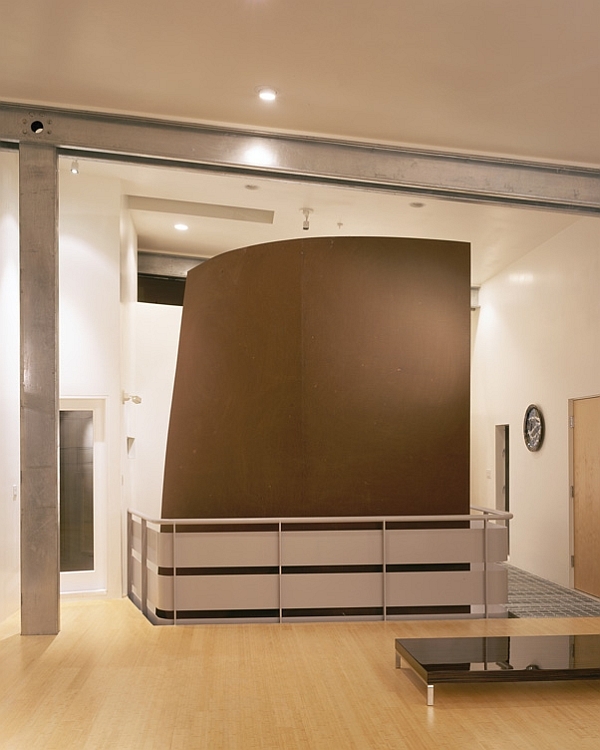 Not only are these steel-framed wonders great as exclusive homes, they also give existing homeowners an option of going for an easy and cost-effective renovation. 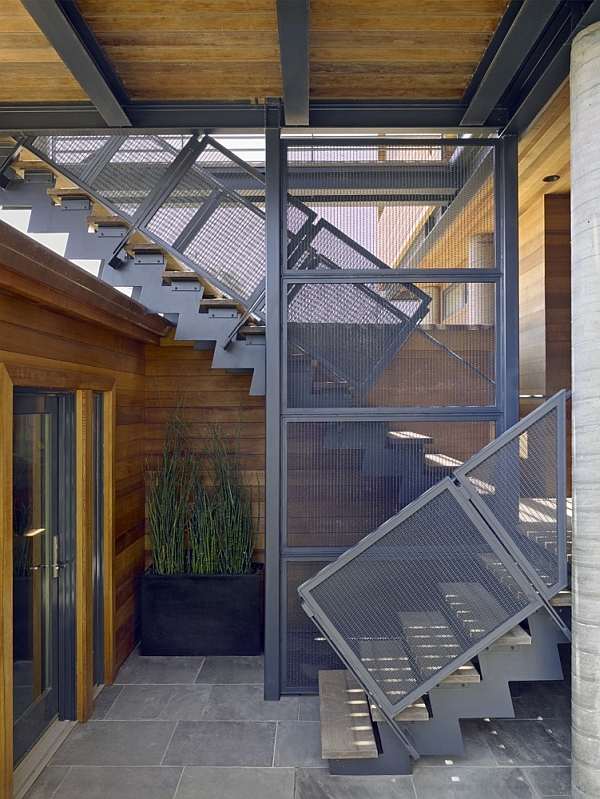 These classy metallic structures allow you to even extend your home by adding open pavilions and glass houses that are contemporary and fashionable. 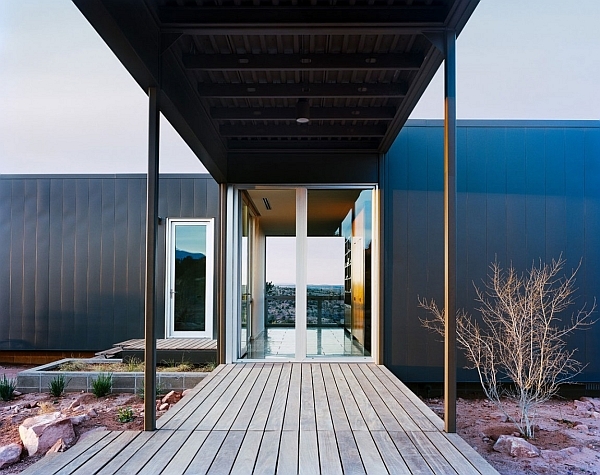 We start off our steely journey with this gorgeous prefab that is developed by Blue Sky Homes and was designed by o2 Architecture. 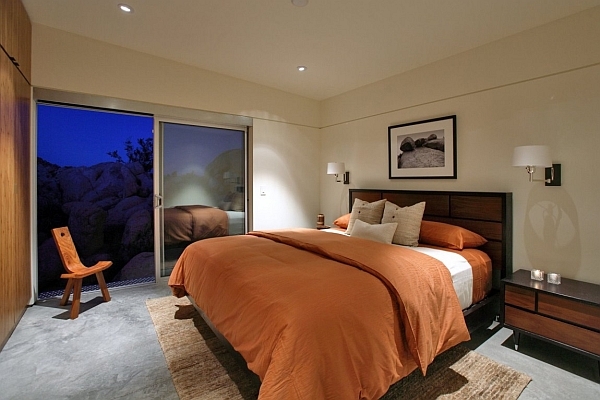 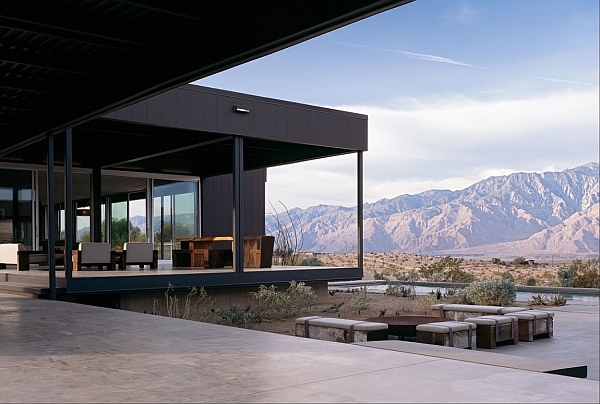 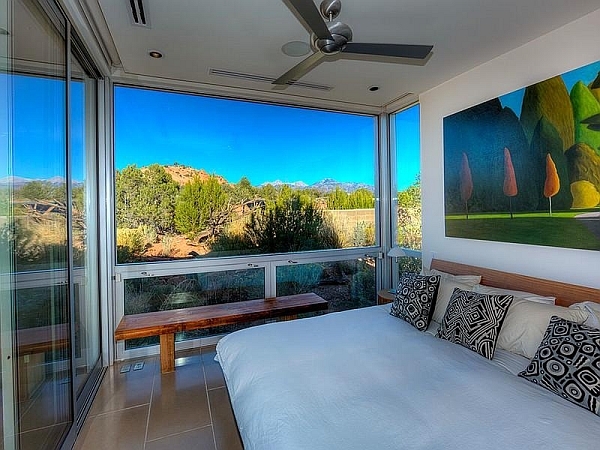 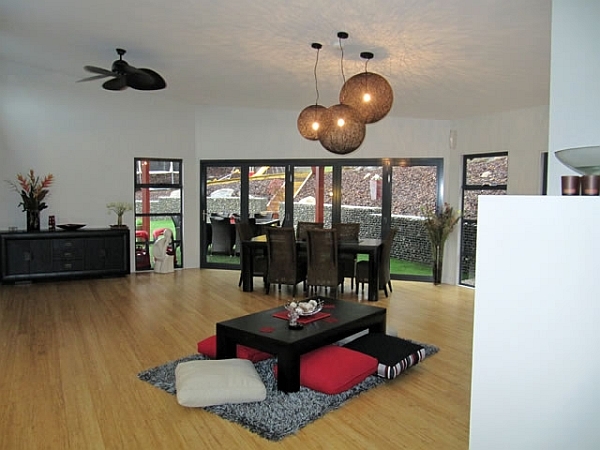 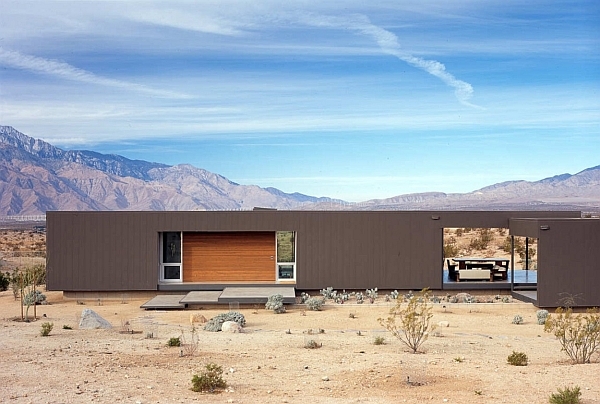 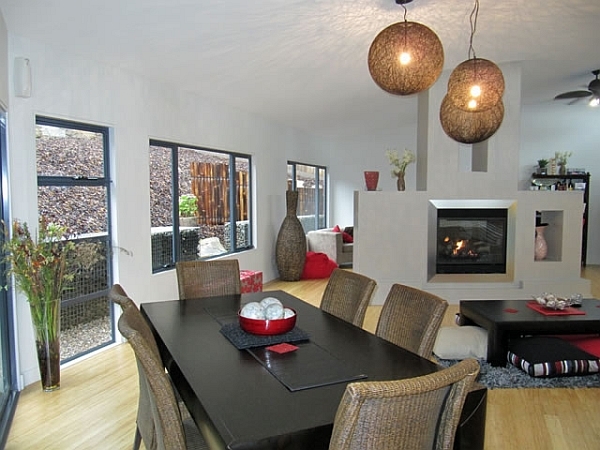 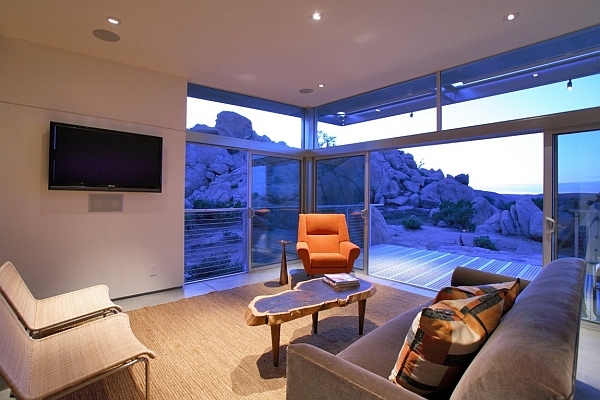 Located in the arid region of Palm Springs, California, this exquisite little house occupies just 90 square meters and features a compact living area, ergonomic kitchen, beautiful dining space, 2 bedrooms and a bath. 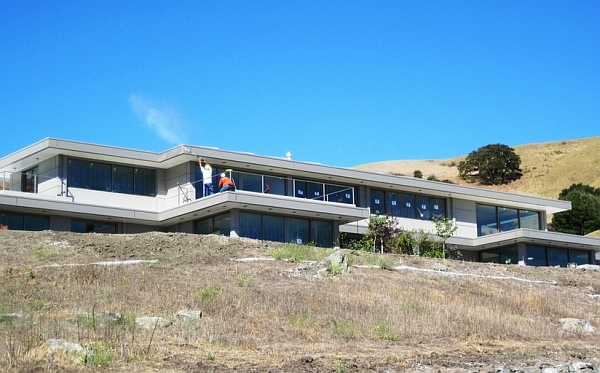 Composed of a frame crafted using modular Steel Thermal Efficient Panels (STEPs), the entire home was assembled on-site in just a single day! 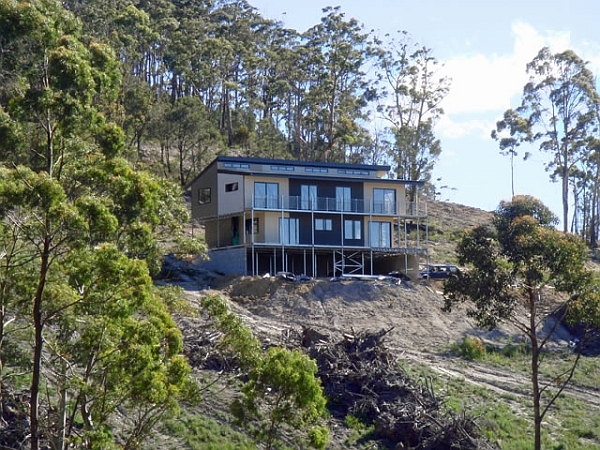 The small home showcases the many advantages of prefab steel structures, and the flat-packed building components also help in delivering an economically and environmentally viable housing solution. 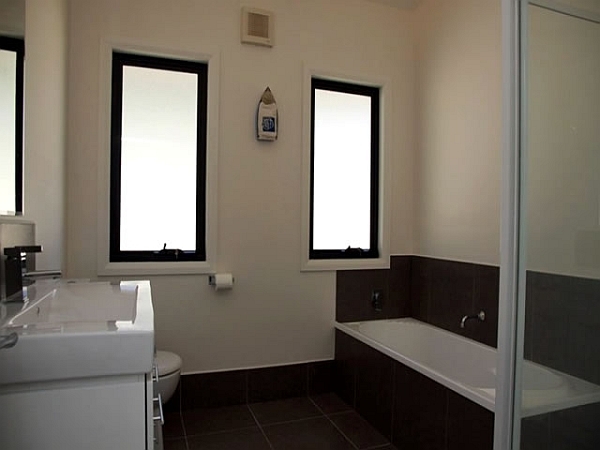 Solar energy drives the power and hot water needs of this stylish space that is available for short-term rent. 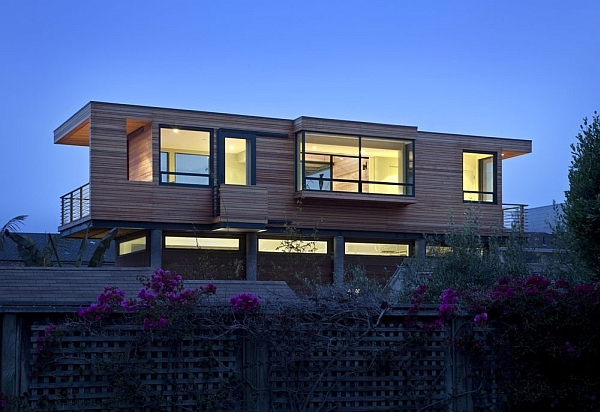 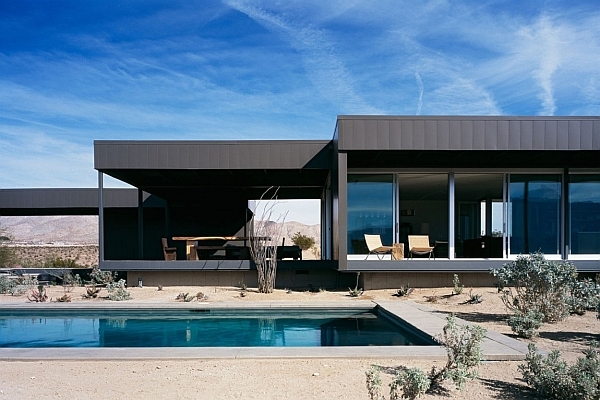 Sander Architects like to call their fabulous prefab homes ‘hybrid houses’. 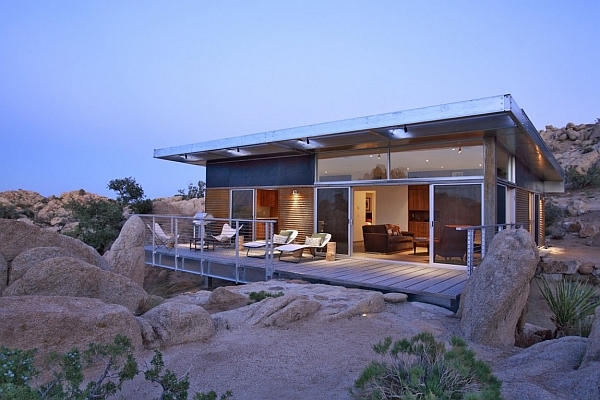 These elegant structures are crafted using an exclusive prefabricated metal frame, skin and roof, making them truly one-of-a-kind. 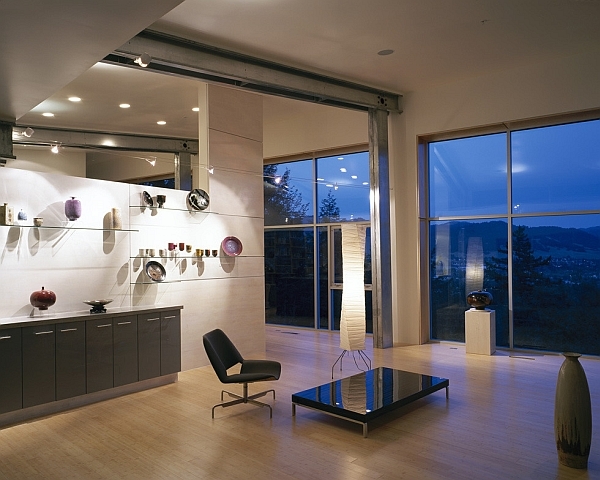 This particular house was designed to suit the specific needs of a brilliant sculptor. 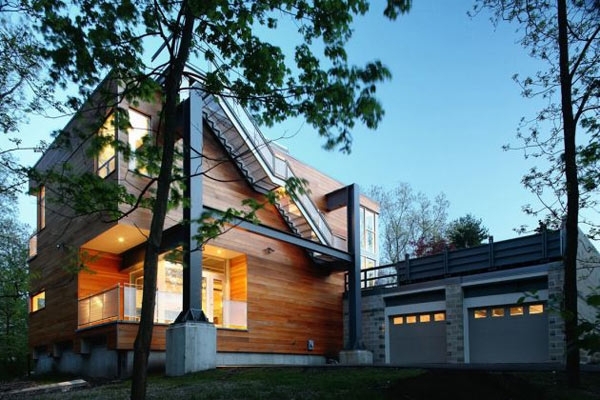 While the steel frame of the house is exposed on the rear, the façade itself looks classy and modern. 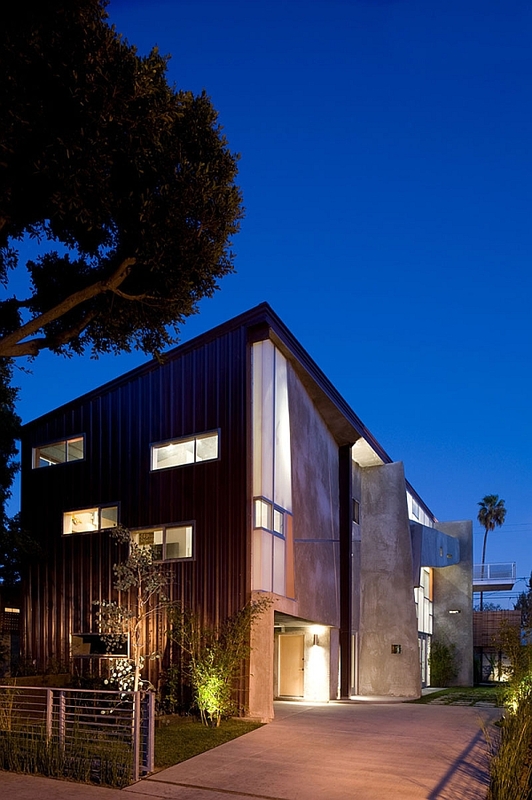 The metallic skin of the house gives it an unmistakable look, while an amazing art gallery-styled entrance welcomes you inside. 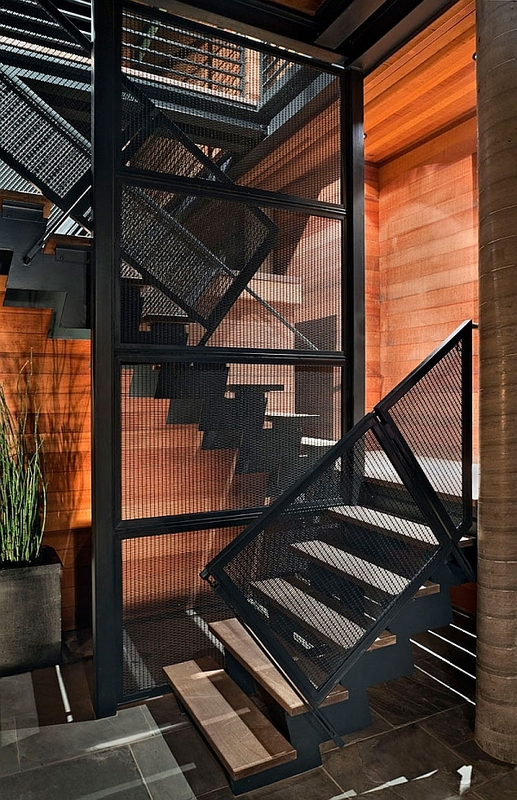 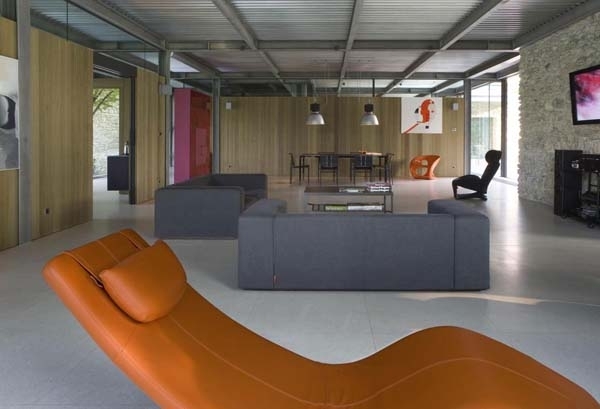 The interior of this steel-frame house is all about showcasing the passion of its owners. 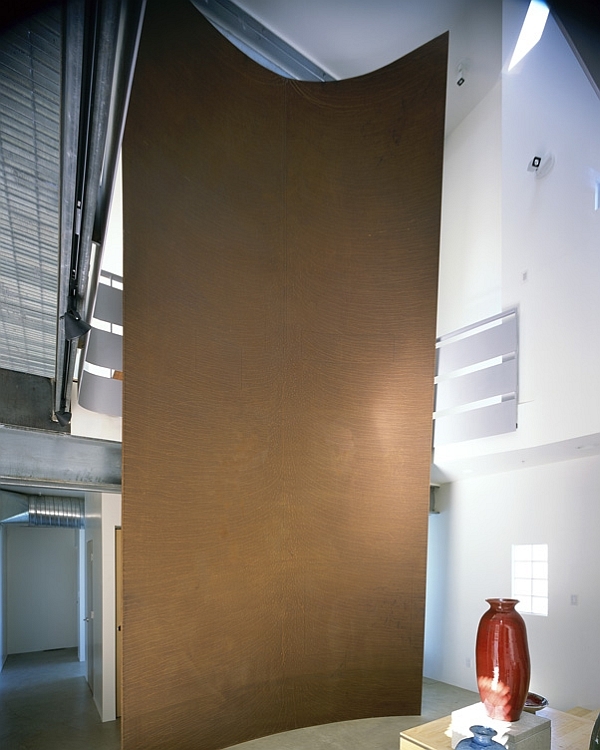 A collection of clay pots at the entrance is followed by a large 22-foot curving, torqued steel wall on one side and a spiral staircase on the other. 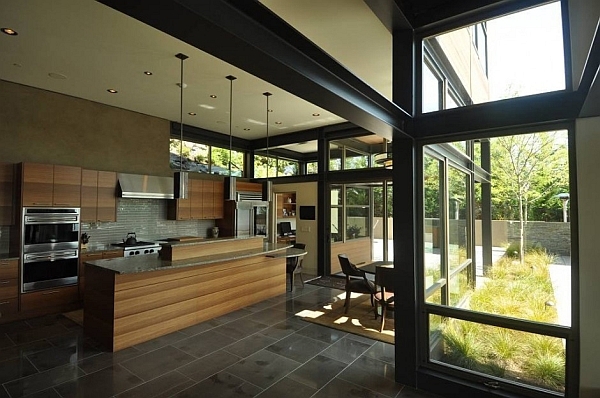 Minimal and contemporary in appeal, the home utilizes glass extensively to usher in natural ventilation. 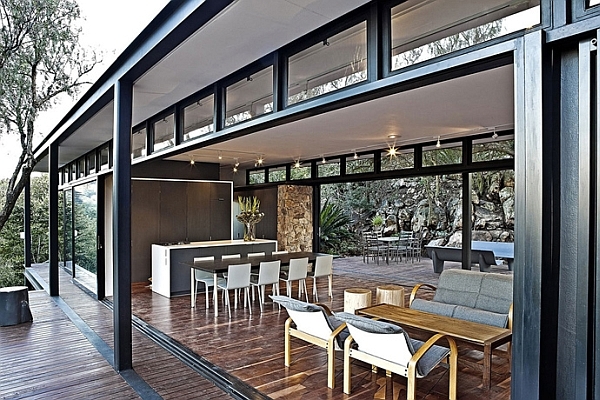 Steel structure houses are inherently eco-friendly, as they minimize wastage of material during construction, and their durability ensures that you need not worry about frequent renovations. 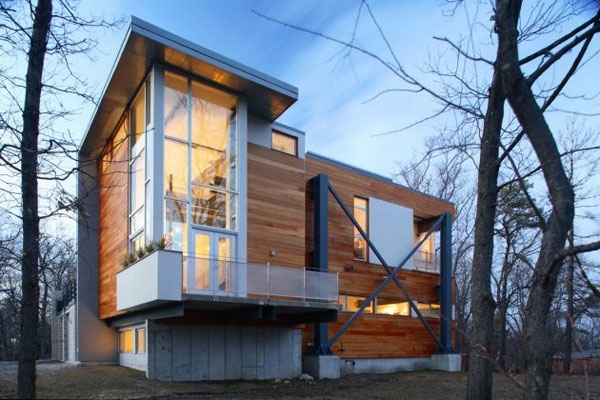 But the Big Dig House in Massachusetts takes sustainability to a whole new level. 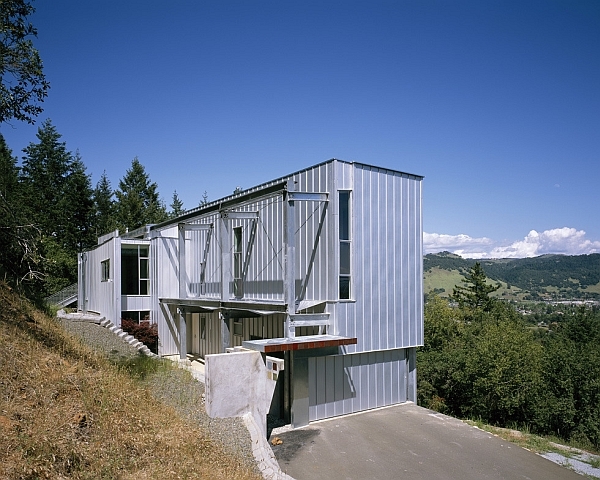 Designed by SsD Architects, the house was built using recycled steel and concrete obtained from an old dismantled highway! 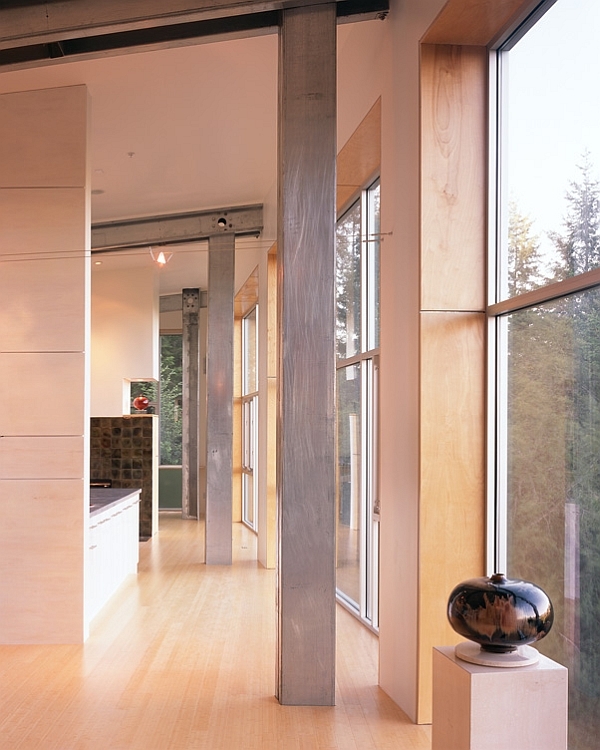 Exposed steel beams inside the house along with raw concrete structures give the home a distinct modern industrial style, while warm wooden surfaces create an inviting aura. 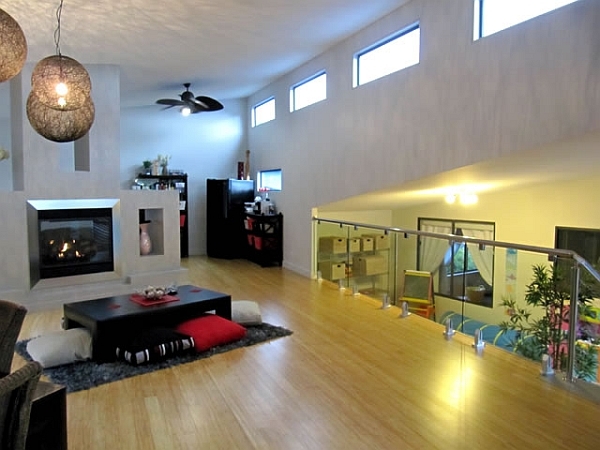 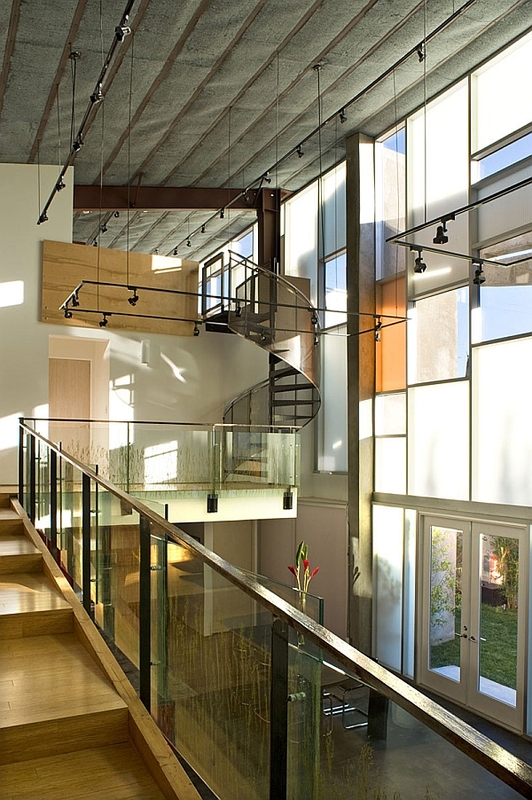 The high ceiling of the living room coupled with a lavish mezzanine level give this green home a grand entrance. 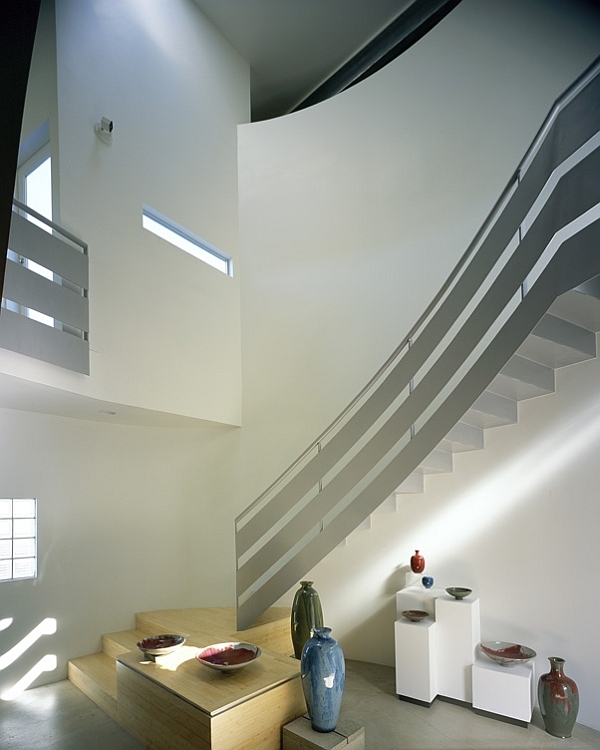 The private quarters of the house are relegated to the top floor, while the lower level features an open-plan living area. 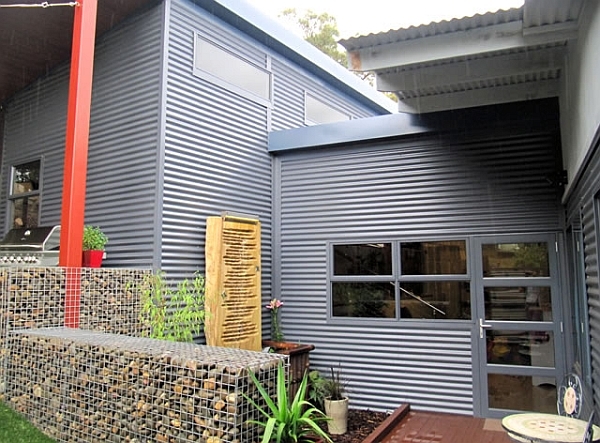 Stylish and sustainable, it truly is a masterpiece with a metallic core! 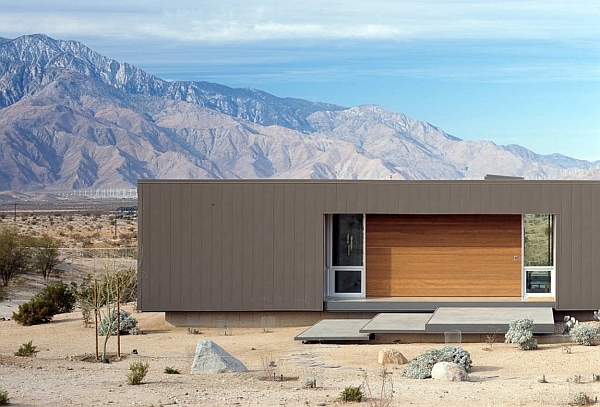 The Hidden Valley House is a perfect example of a stylish prefab that is almost entirely crafted in a factory and assembled on-site within no time. 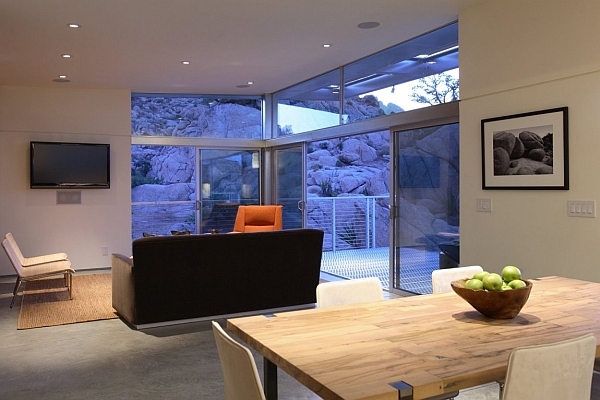 Precut steel beams and joists make up the backbone of this modern home located in the desert of Moab, Utah. 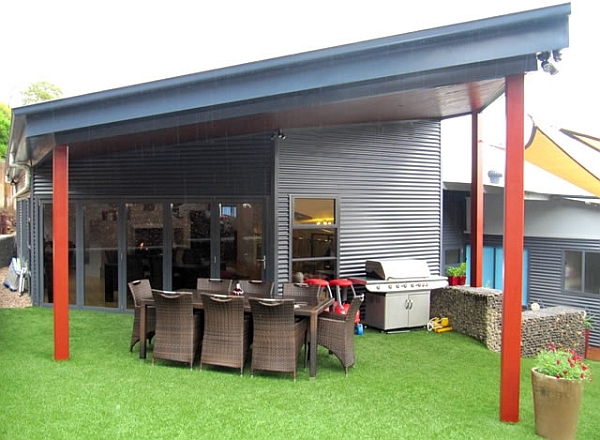 Structurally insulated panels were added to the steel framework to fashion five interior modules that house the living area, kitchen, two bedrooms and bathrooms. 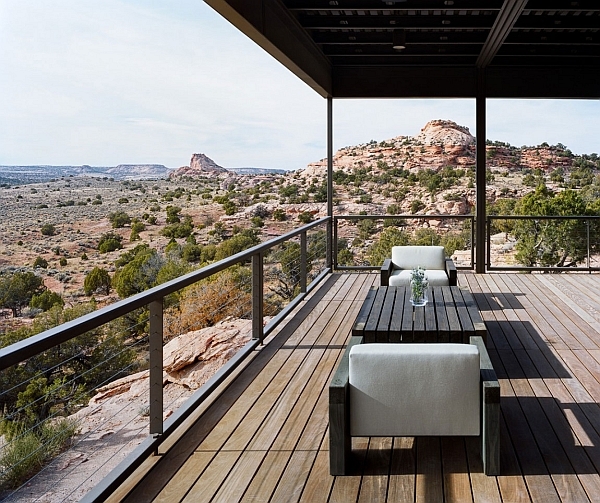 Offering dramatic views of the landscape, the house blurs the lines between the indoor living environment and the expansive outdoors with an extensive series of sliding glass windows. 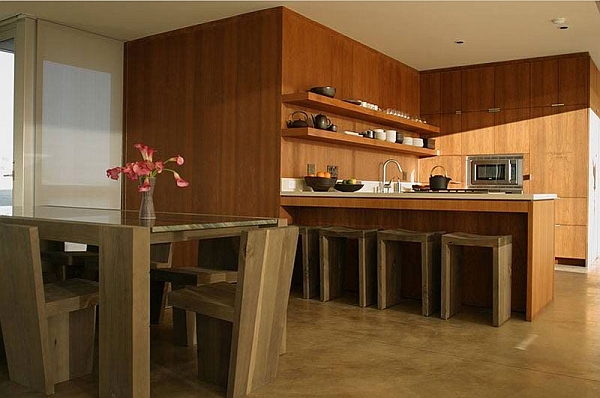 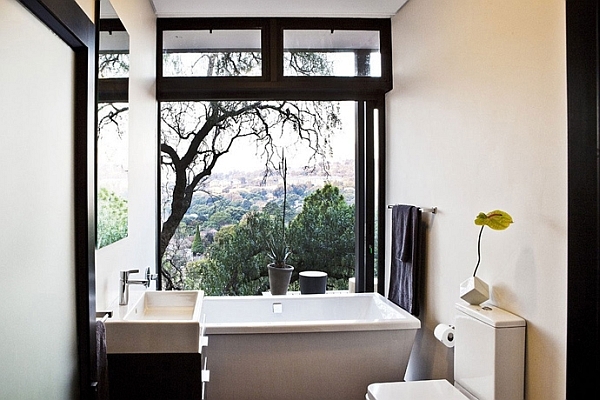 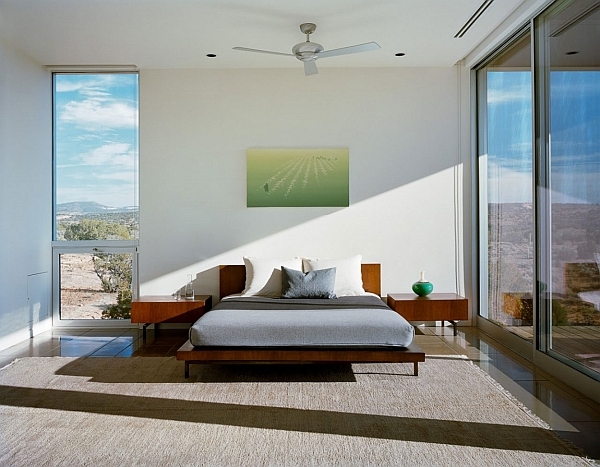 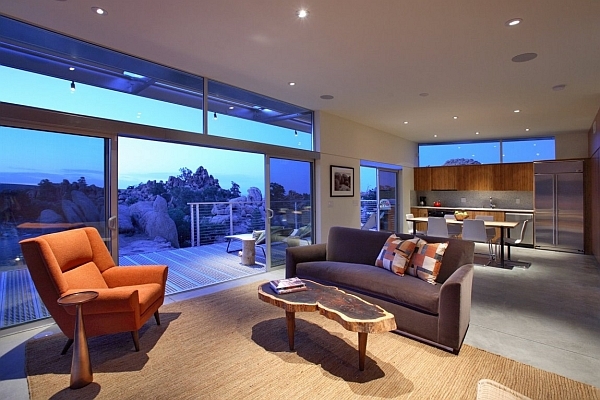 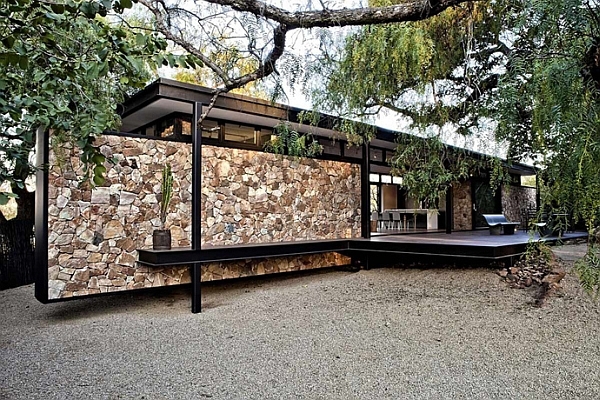 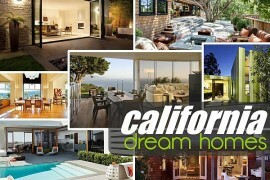 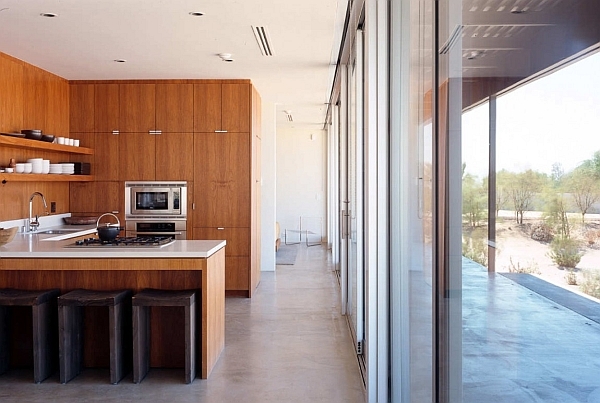 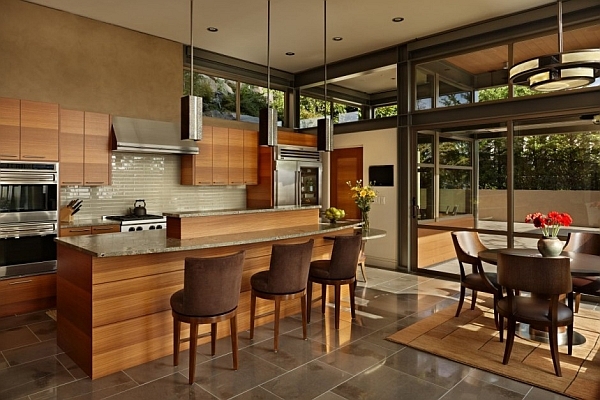 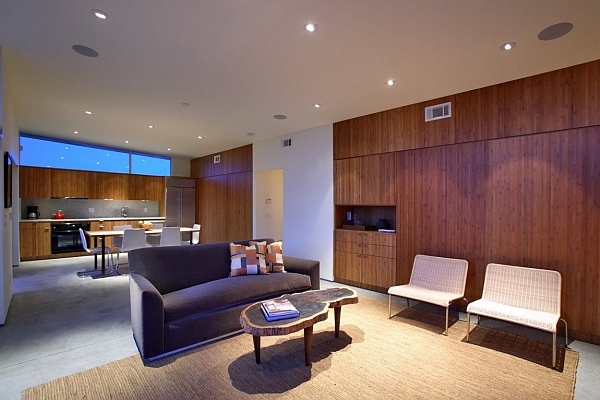 Conjured up and created by Marmol Radziner, the serene and trendy house is spread across 2,500 square feet. 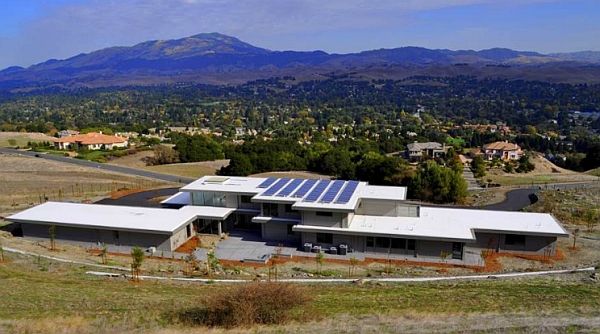 Matching any conventional home in aesthetics and ergonomics, this steel-framed prefab comes with solar panels and geothermal heating systems that give it a tinge of green goodness. 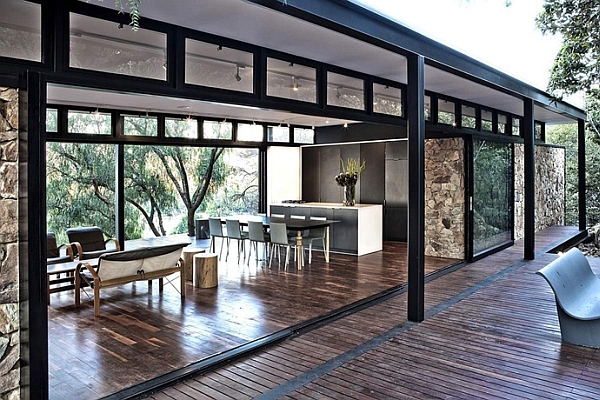 The design of the home blends indoor and outdoor living spaces with large decks, floor-to-ceiling windows, and an open plan. 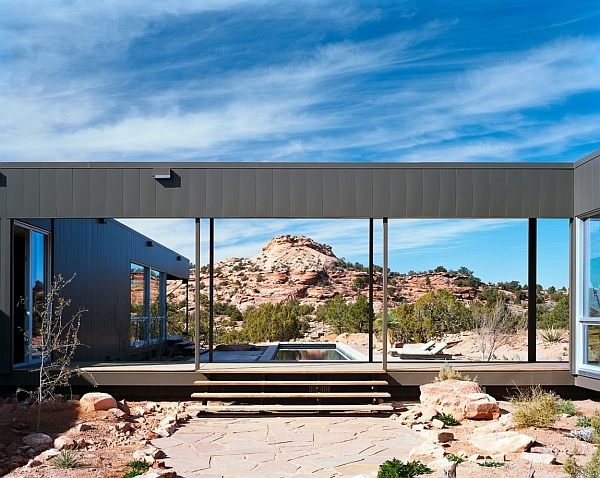 The main approach winds around the solid, metal-clad side of the home, revealing the opening of the front entry deck with a broad view across the pool to a tall boulder formation. 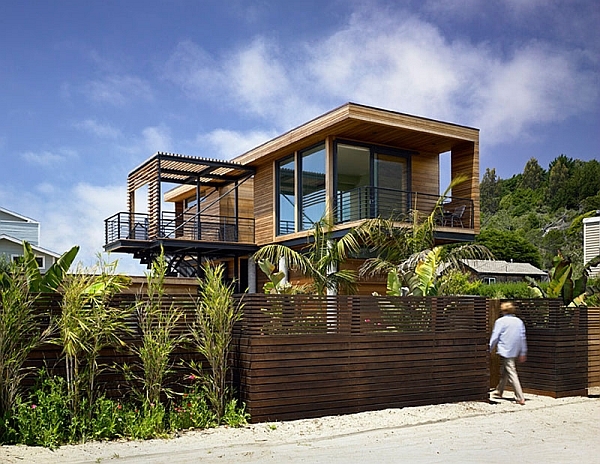 The advantages of a prefabricated steel frame go beyond the mundane, and in the case of this particular house in Stinson Beach, California, San-Francisco-based studio Peek Ancona has used a distinct steel framework to create a flood-proof house. 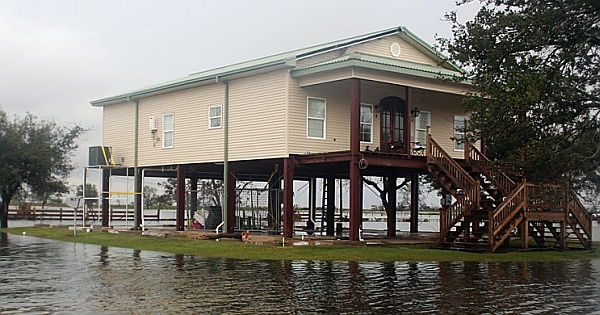 The idea behind the structure was to design sturdy and versatile homes that can withstand a sudden flood hazard or increase in sea level due to a natural disaster. 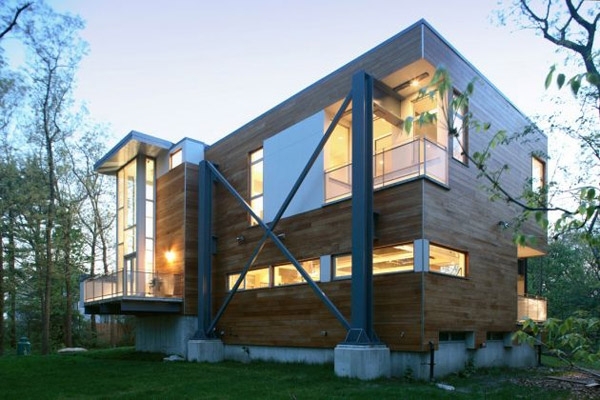 The cantilevered structure of this cool house was built using a sustainable steel kit that can be assembled with ease pretty much anywhere. 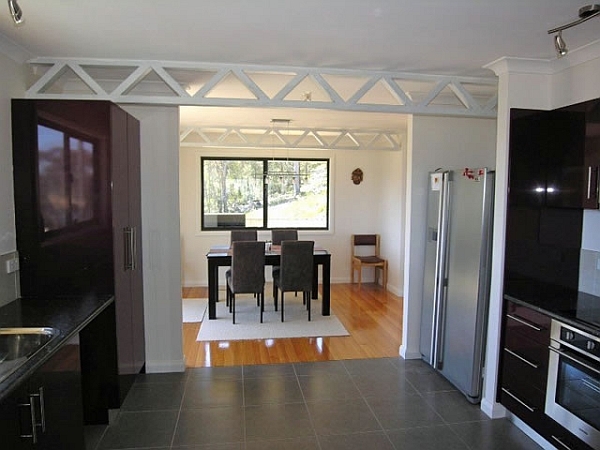 The interlocking steel frame was coupled with a truss system to design as much usable space under the house as possible. 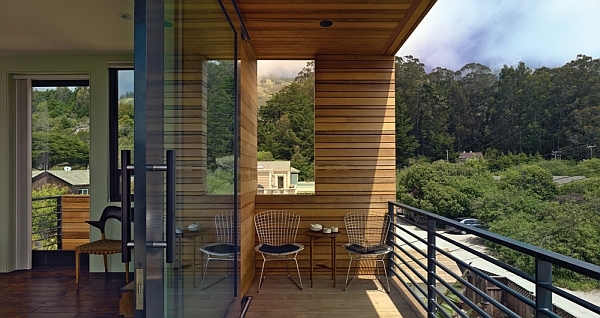 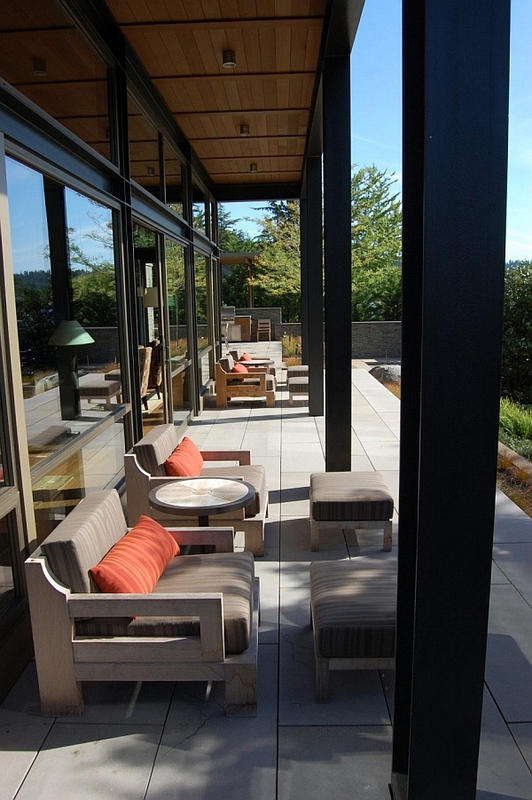 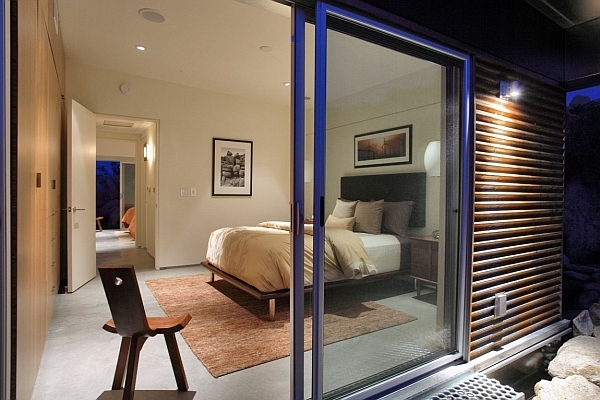 Western Red Cedar on the outside and radiant-heated bamboo flooring on the inside give the space an organic appeal. 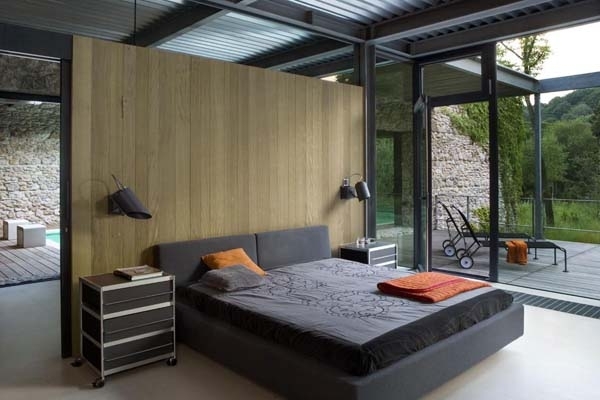 Chic grey walls complement the exposed steel meshes and beams perfectly to give the interior a style of its own. 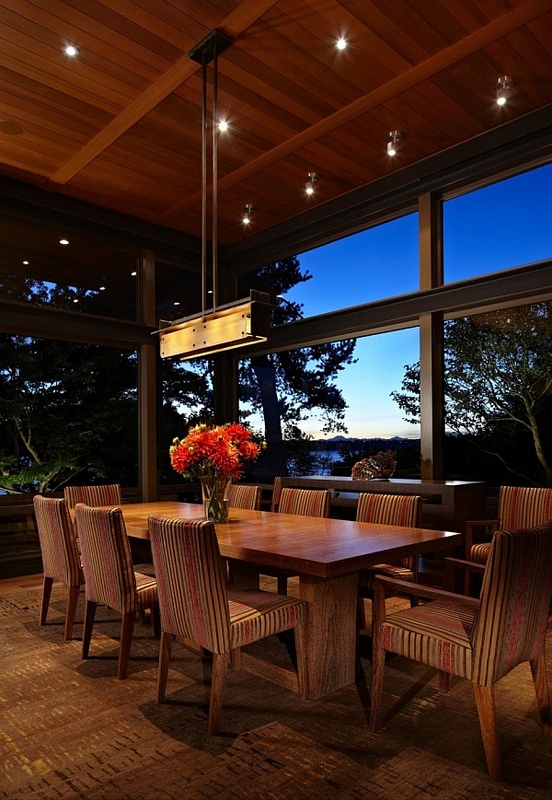 Exposed vertical and horizontal steel beams running throughout this lovely lake house blend beautifully with the expansive glass windows and natural wooden ceilings to paint a truly picturesque setting. 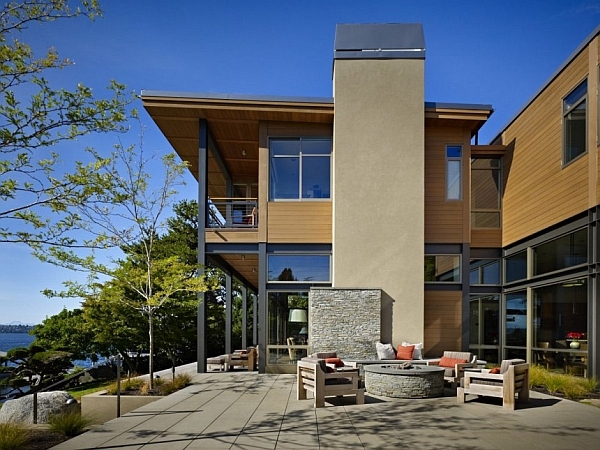 Designed by McClellan Architects, the home has a brilliant style of its own. 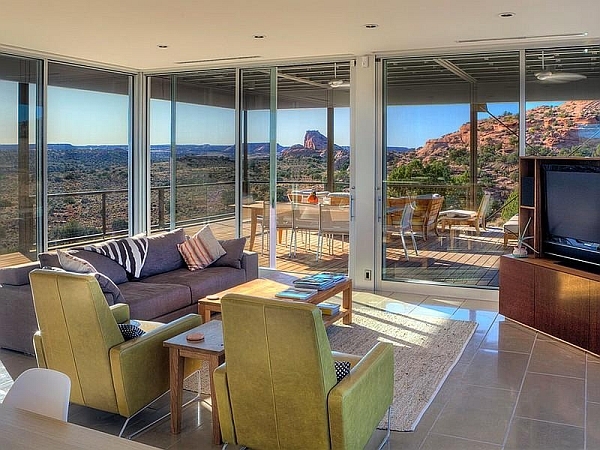 Combining elegance and simplicity with an unassuming chic industrial style, the lake house is all about the outdoors and the sweeping views it offers. 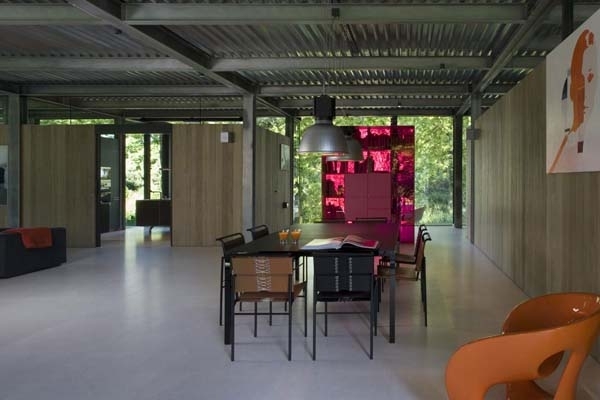 The exposed steel frame of the house becomes an integral part of its aesthetics and allows the home great flexibility in its design. 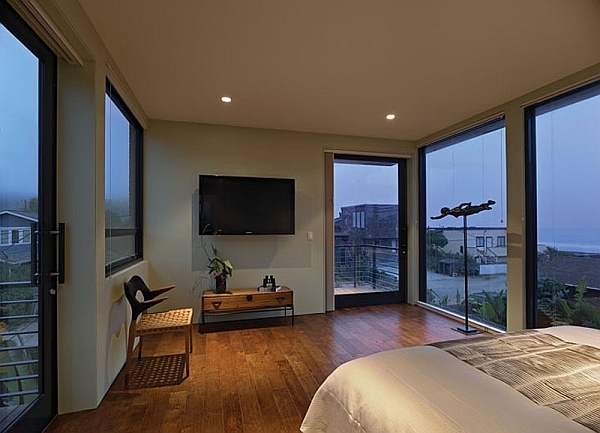 With a sweeping outdoor patio, rooftop terrace and a tidy dining area indoors, a stay here is all about relaxing in style as you take in the many sights and sounds outside. 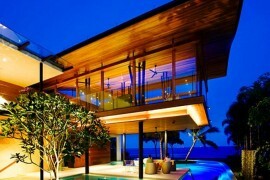 After taking a look at the expansive and the extravagant, we move on to the unpretentious and the modest. 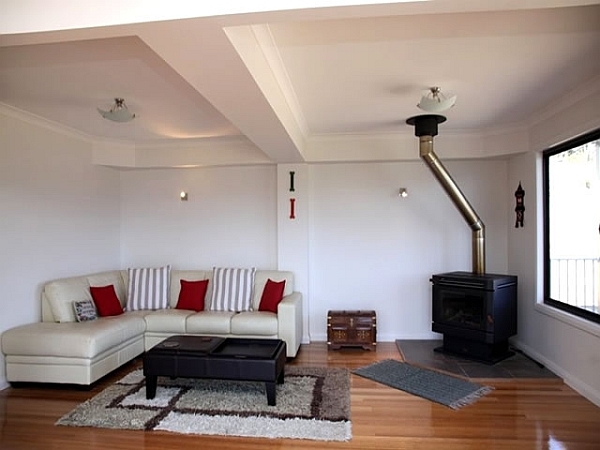 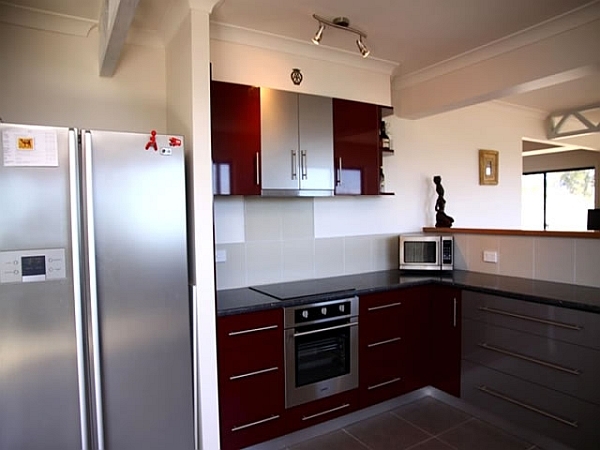 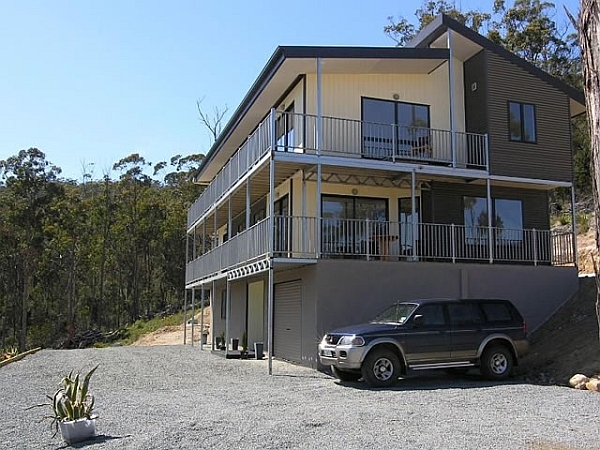 This classy yet compact little house was built by Hobart-based Statewide Constructions, and what it lacks in size and grandeur, it makes up for in elegance and comfort. 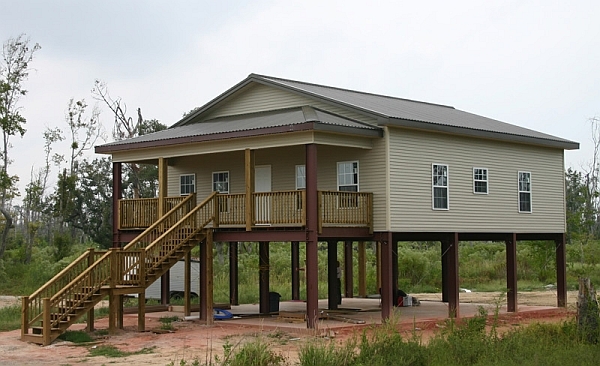 Built almost entirely on the factory floor, this steel-frame modular home can be assembled within no time, and homeowners can instantly move in without having to wait for months, as is the case with conventional homes. 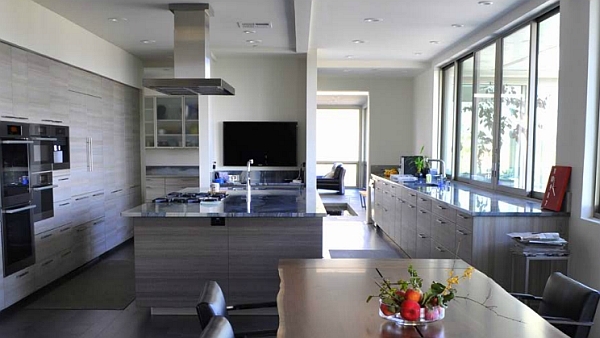 Clad in cool grey on the outside and embracing calm, neutral tones on the inside, the customized home looks sleek and spacious. 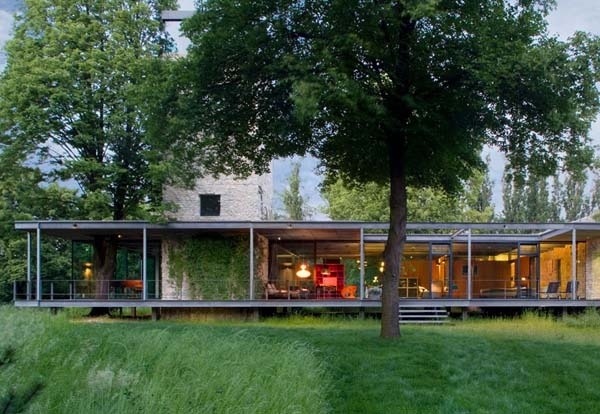 Located on the outskirts of Krakow, Poland, Jodlowa House stunningly incorporates glass into its modern construction. 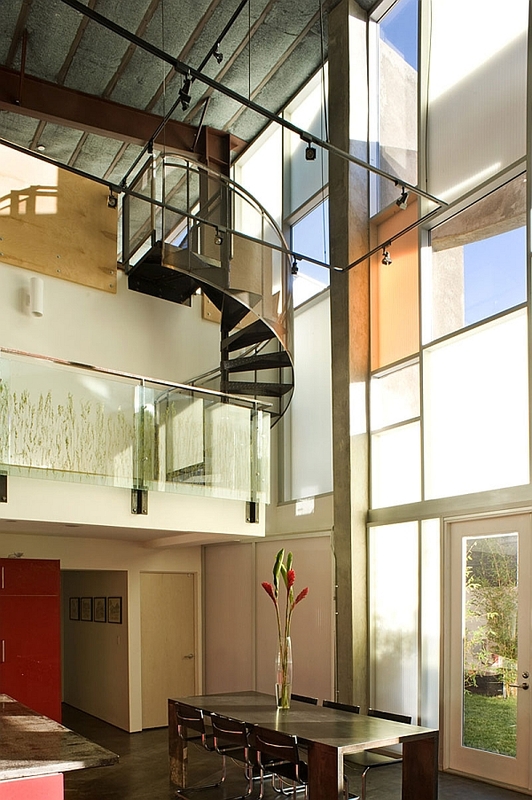 This dazzling contemporary structure was crafted by architects from PCKO along with MOFO Architects, and its incredibly open form instantly makes it endearing. 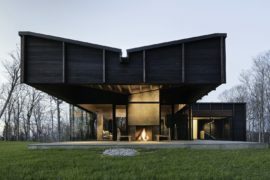 But at the heart of this innovative house that also features a striking stone viewing tower is a beautiful steel frame that actually made the design possible. 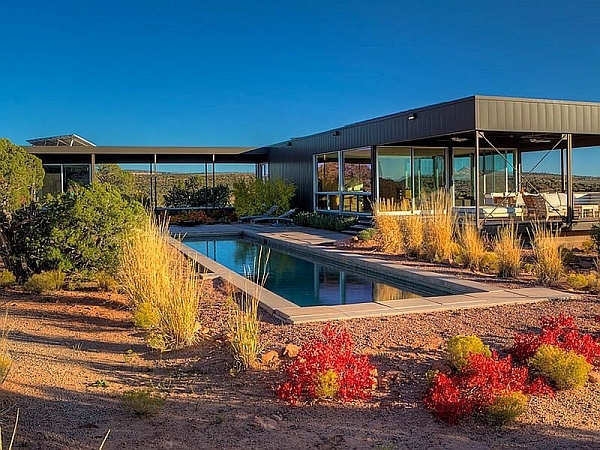 With metallic beams forming the core framework of the house, the architects could easily craft an all-glass setting that brings the surrounding scenic landscape indoors. 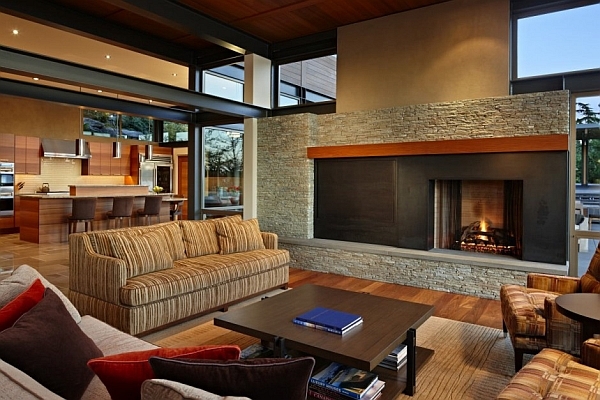 There are those times when aesthetics precede ergonomics and other occasions when form comes firmly ahead of function. 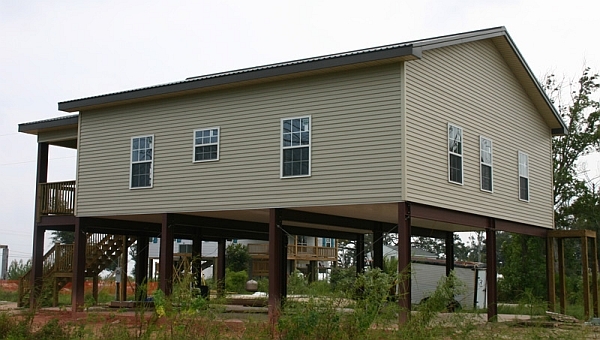 When engineering a home in locations that need to withstand rough weather conditions, you need a structure that is both stoic and adaptable. 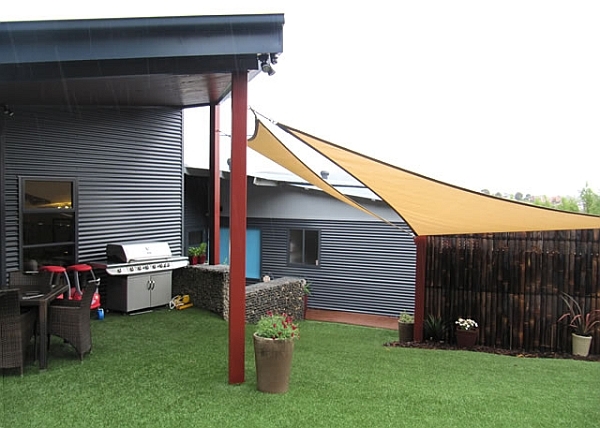 Designed specifically for coastal areas, the Windmaster is capable of taking on category 4 hurricanes and withstand wind speeds up to 155 mph. 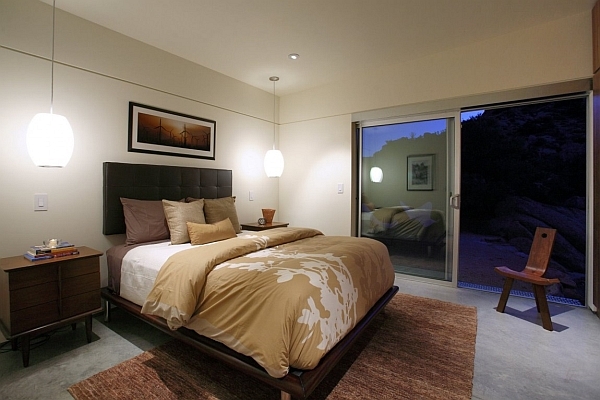 Perfect both as a beautiful beachside vacation home and as a permanent residence, it can be customized to suit your specific needs. 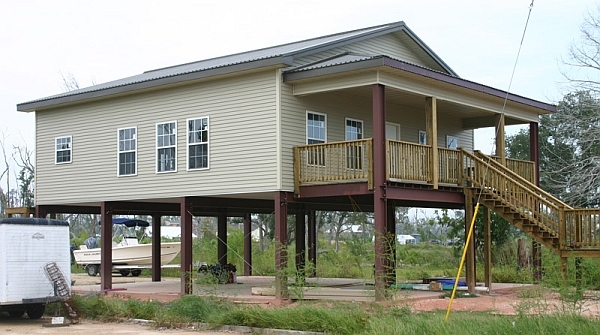 Located in Palm Beach, this cantilevered steel frame prefab designed by Kodiak Steel Homes withstood the furry of Hurricane Ike in 2008 without sustaining any damage whatsoever… Talk about structural integrity! 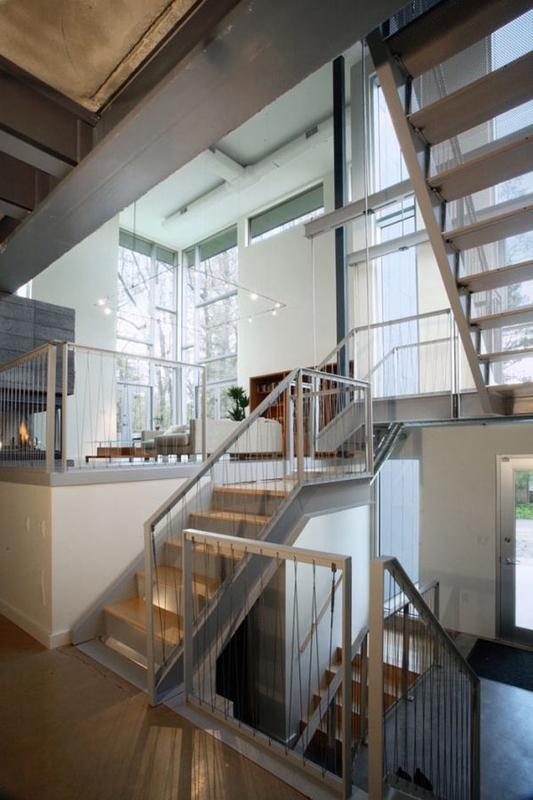 A steel framed structure with large glass walls and windows is not the typical image of a beautiful cottage in the woods. 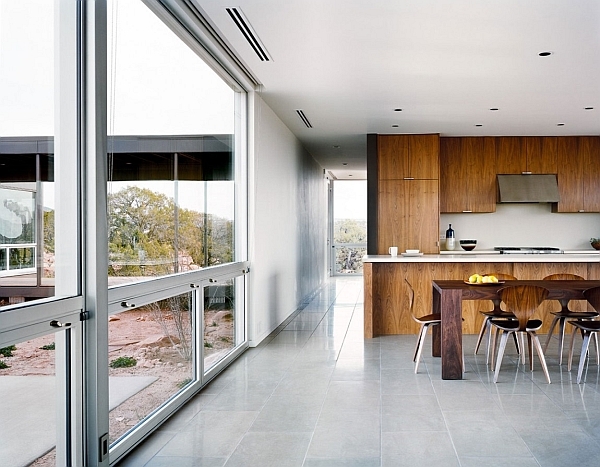 Yet architects and designers across the globe are quickly redefining this set perception. 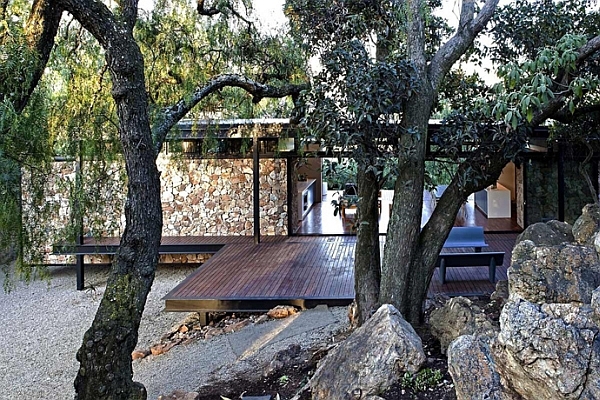 Located on the Westcliff Ridge in Johannesburg, South Africa, the Westcliff Pavilion is a tranquil, private building that seems to float gently above a ridge to create an incredibly cool visual. 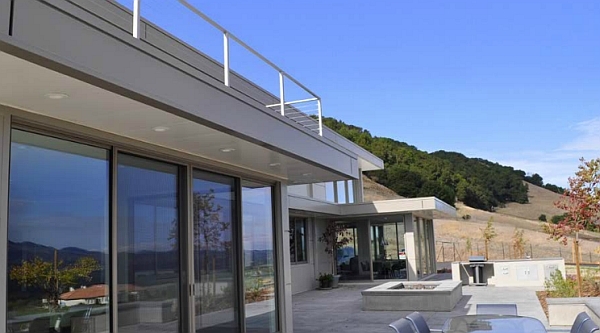 Since access to the site was limited to a long, narrow driveway through a scenic landscape, the architects from GASS wanted to keep the on-site construction to a bare minimum. 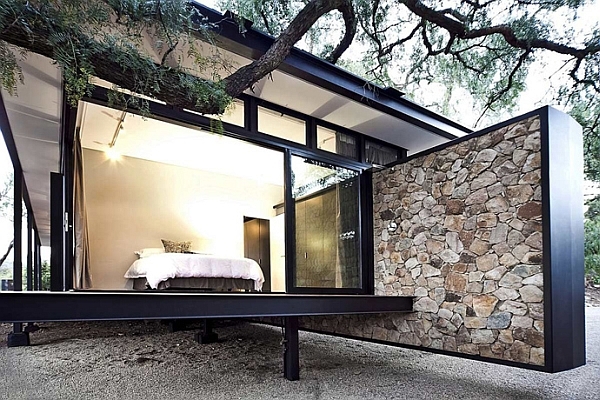 Using a prefabricated steel frame accomplished this with ease, and by using the metallic framework on a cantilevered base, there was minimal damage done to the ground as well. 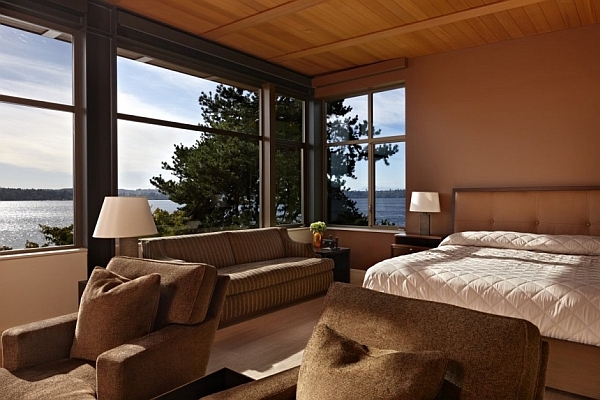 With an open and airy appeal, sweeping views and plush decor, the exclusive cottage exudes a serene and soothing ambiance. 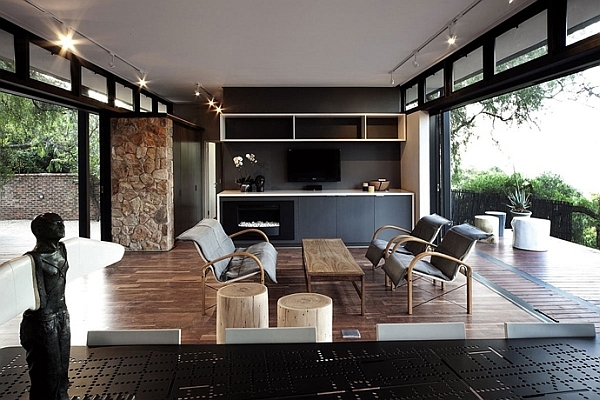 When the owner of the Residence for a Briard approached Sander Architects, the initial idea was to renovate his lavish old bungalow to create a modern home. 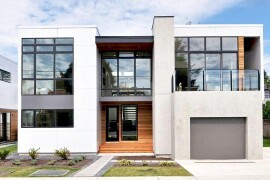 But pretty soon, the idea turned into the design of a new hybrid house ground-up that would pretty much fit in the same budget range as a modern renovation would demand. 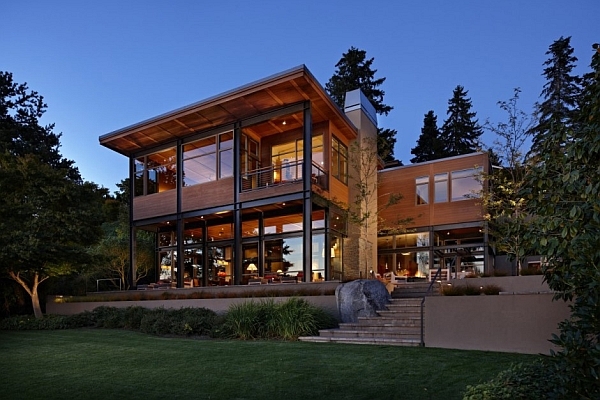 The expansive and audacious Residence for a Briard showcases the cost-effective nature of metallic-frame structures with flair and panache. 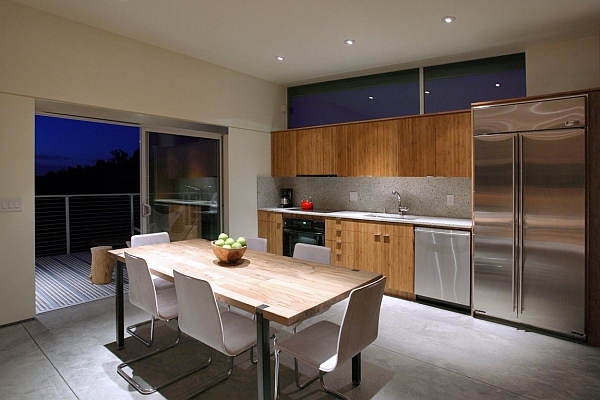 Other green features of the home include recycled blue jean insulation, sunflower seed wall board and bamboo flooring. 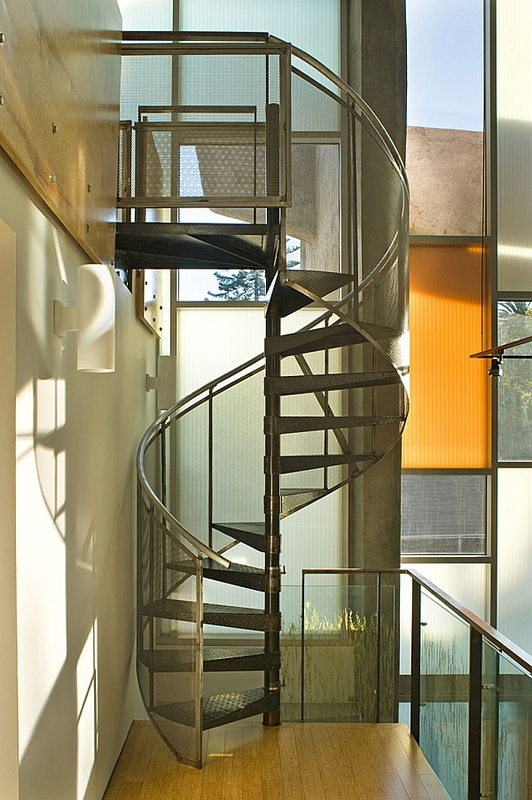 The interesting façade of the house takes inspiration from the form of a violin, while the interiors overwhelm you with their sheer magnitude and the visually spectacular spiral staircase. 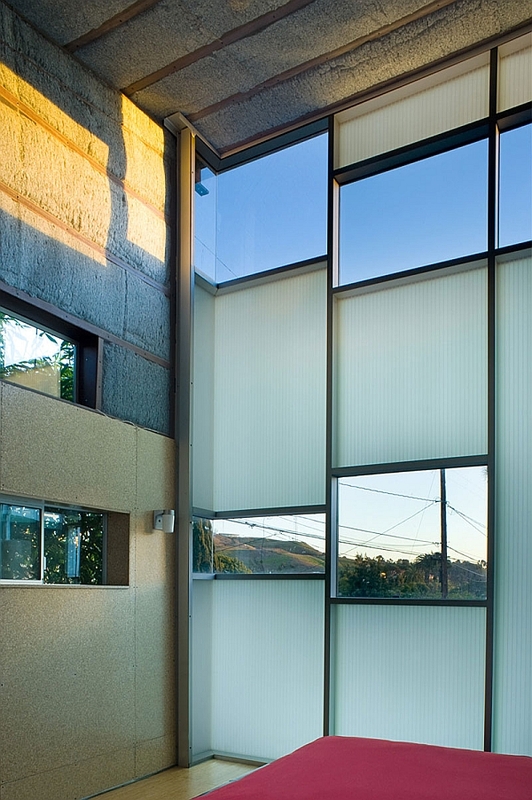 And yes, the home is named after a large loving pet, and the architects had to also ensure that it was as dog-friendly as possible when complete! 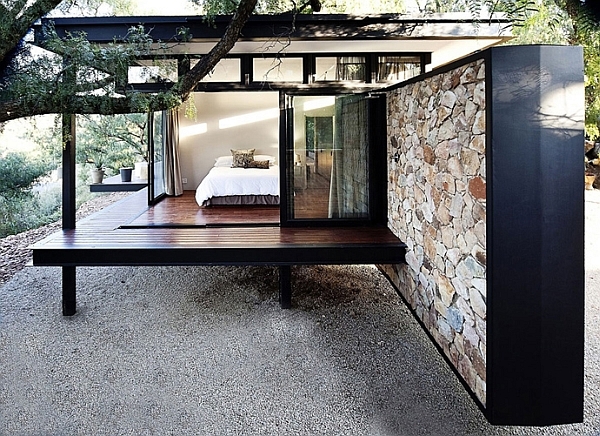 Its structural frames and exterior walls and roof are all prefabricated off-site by warehouse manufacturers and shipped to the site in pieces on one flat-bed truck. 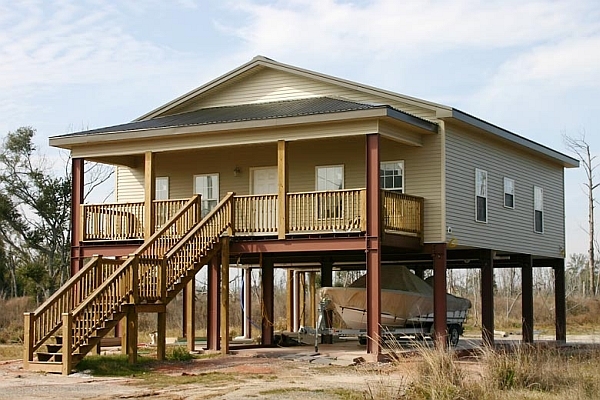 This entire shell cost $22,000. 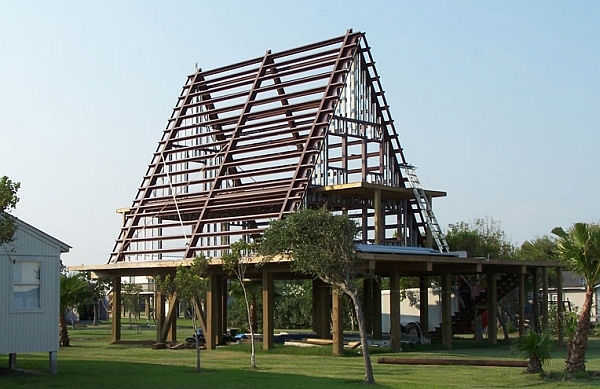 These pieces then bolt together like an erector set in three weeks time. 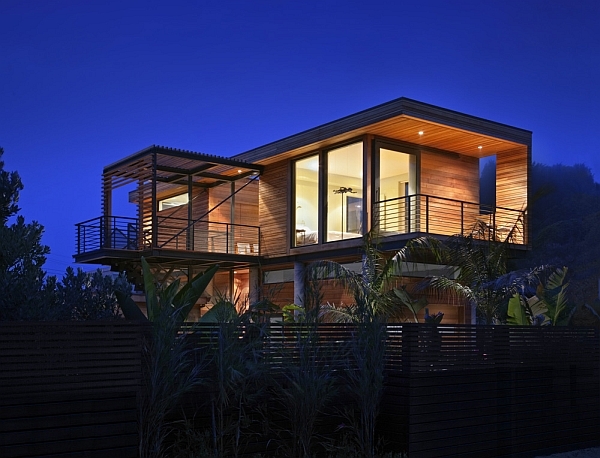 Once the shell is complete, all interior walls, systems and finishes are assembled in a traditional manner. 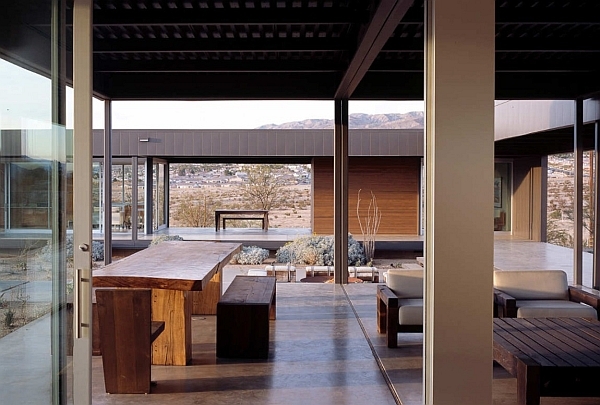 Anchored on a floating platform just above ground, the Desert House was built to provide a comfortable living space in harsh and arid weather conditions. 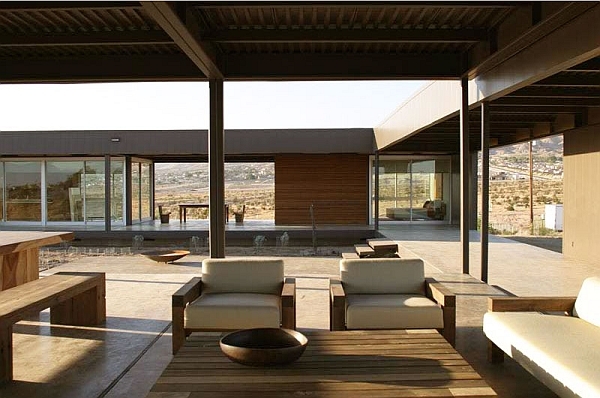 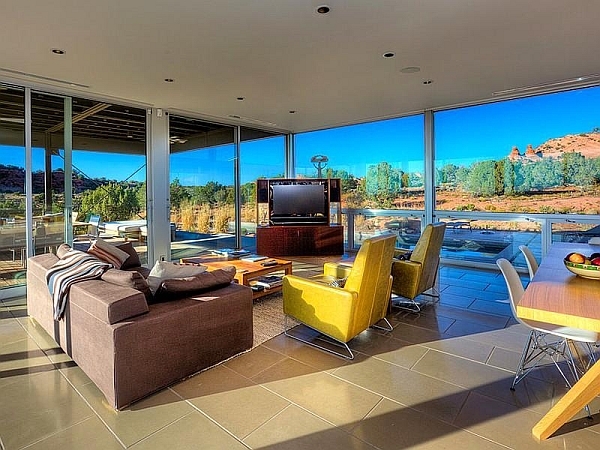 Set on a five-acre site in Desert Hot Springs, California, the lavish house offers 2,100 square feet of indoor living space and 2,400 square feet of outdoor living space. 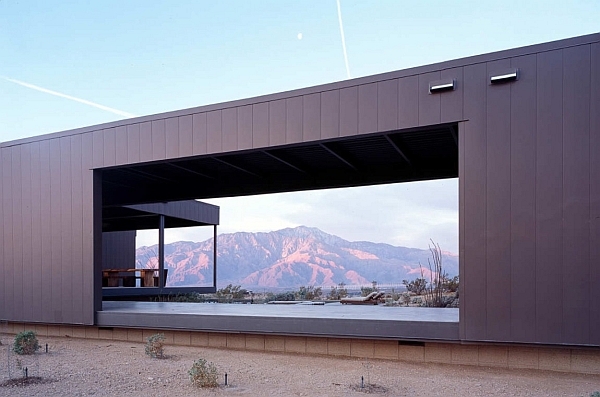 Designed for Leo Marmol and his wife Alisa Becket, this elongated house features six prefab steel modules that have been attached on site to create a spacious and airy interior. 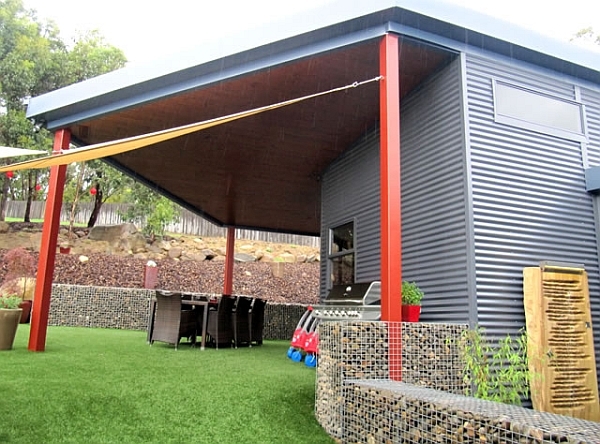 Sunshades coupled with cladding in wood and steel offer ample shade during the hot daytime and provide proper insulation when the temperature drops steeply at night. 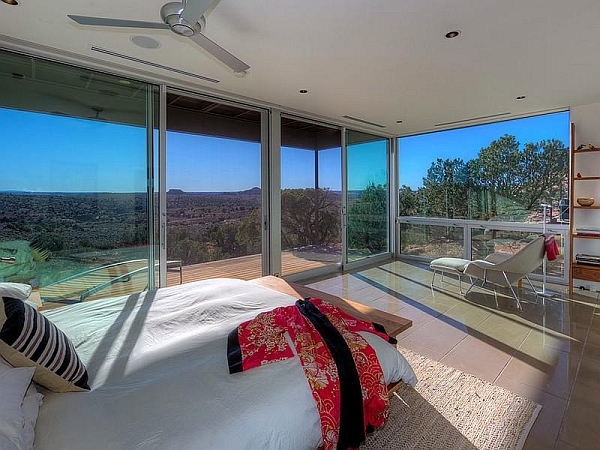 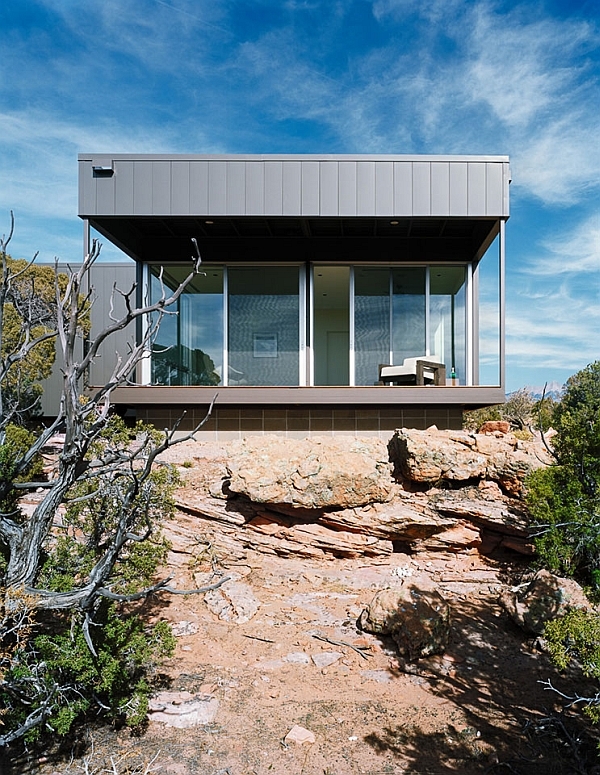 Employing both passive and active solar technologies, the prefab steel house allows you to switch between secluded privacy and unabated views with the simple switch of the sunshades. 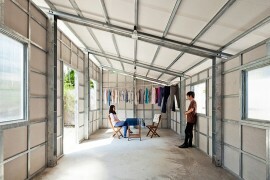 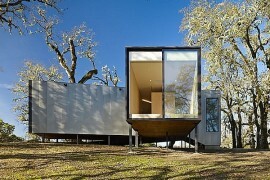 Additional prefab units can be added at any time to extend the living space as the needs of the family grow with time. 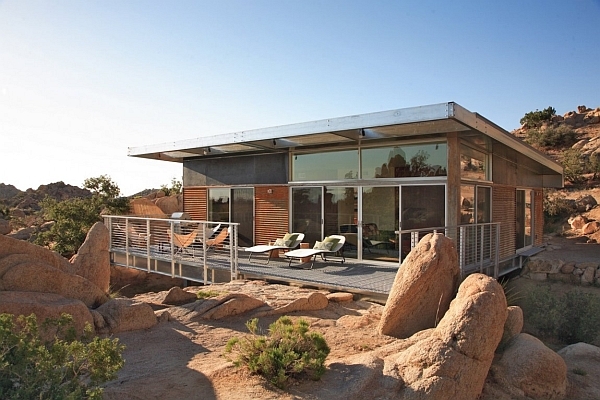 Metallic structure homes offer amazing flexibility in design and improvised floor plans. 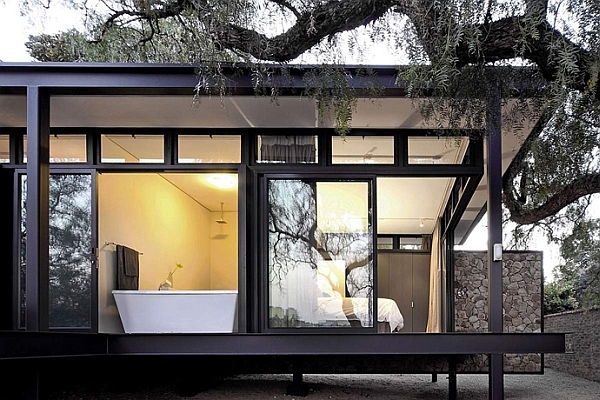 Yet that does not mean that you will only end up with an unusual looking home that stands out from the pack. 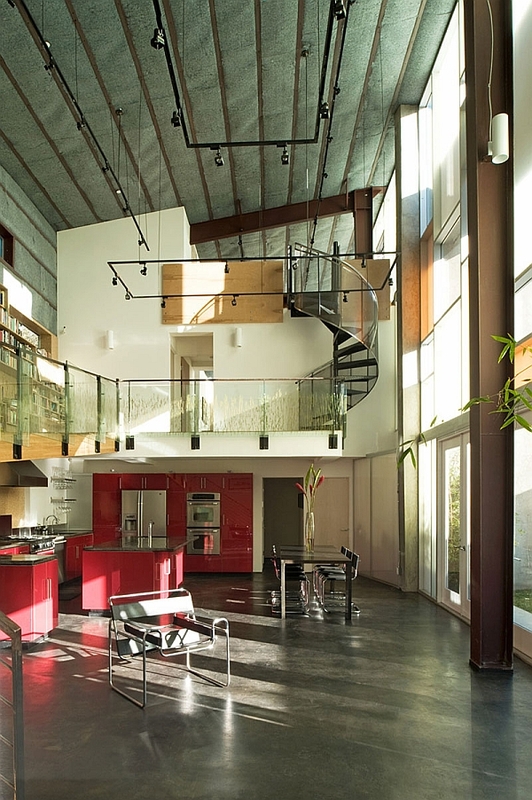 Steel-frame houses can match the exact style of a conventional modern house with interiors that show little sign of the metallic framework. 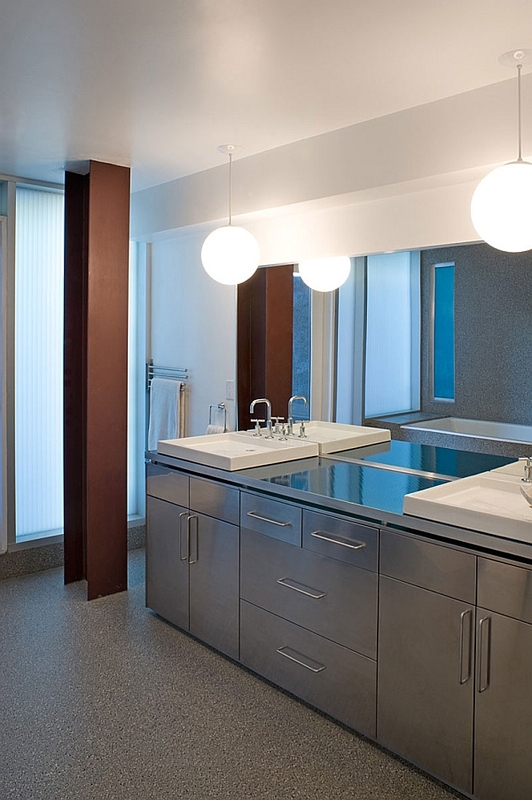 This custom-crafted prefab is clad in trendy grey on the outside and features a tasteful interior with plush contemporary decor. 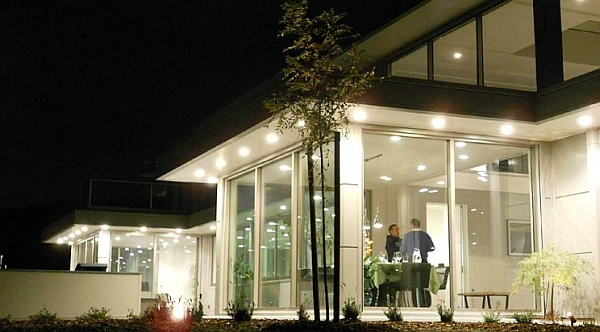 Light steel-frame constructions do provide both architects and owners with functionality, reliability and speed, but they also can be used to build equally alluring luxurious villas and vast residences. 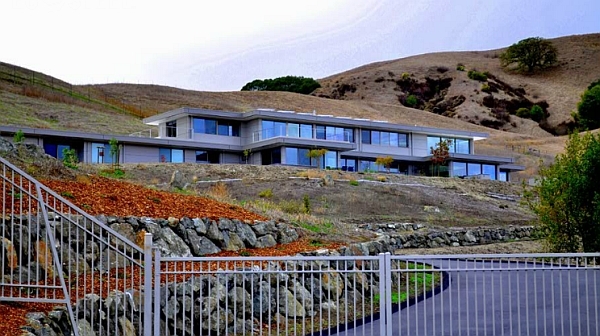 Spread across 10,300 sq ft, the Mount Diablo House is far more opulent than many conventional homes. 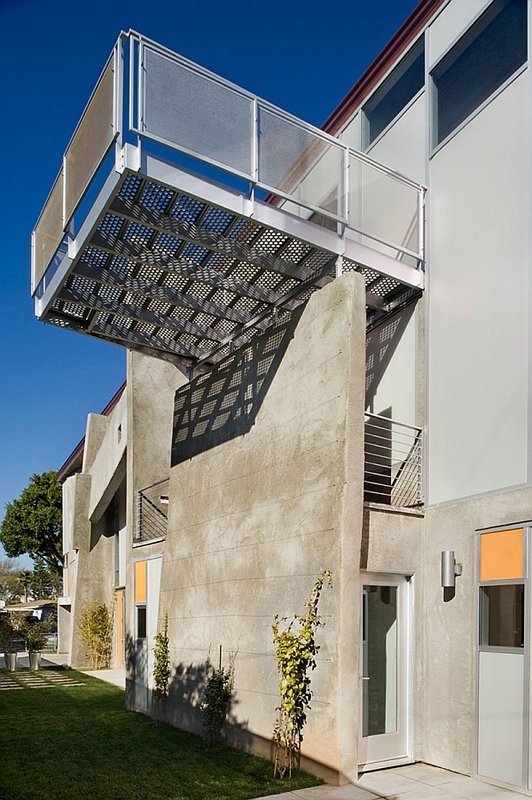 Equipped with rooftop solar panels and built using an extensive prefab steel frame, the extensive project was completed rapidly thanks to the use of a factory-made framework. 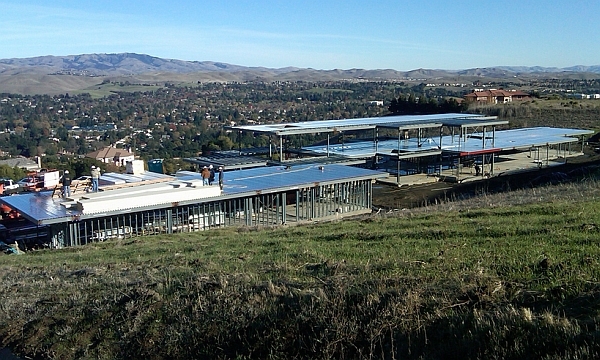 Engineered by EcoSteel, the complete project sits proudly in the eastern hills of Danville, California. 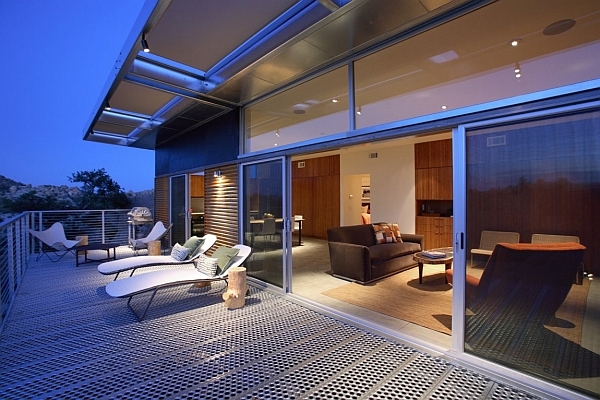 We have seen resilient steel frames being used to build expansive houses, hybrid designs, contemporary residences, cool cottages, stoic all-weather shelters and grand glass pavilions. 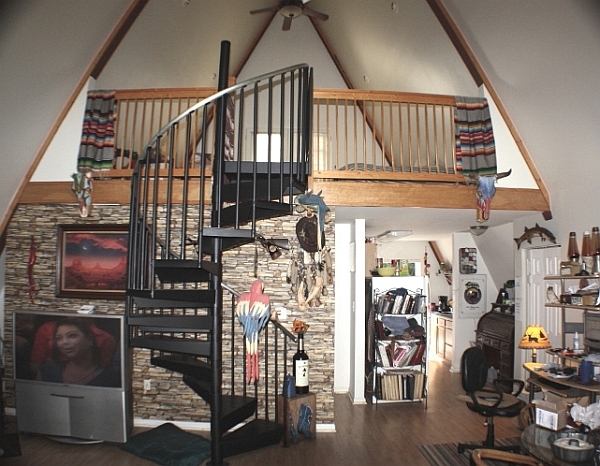 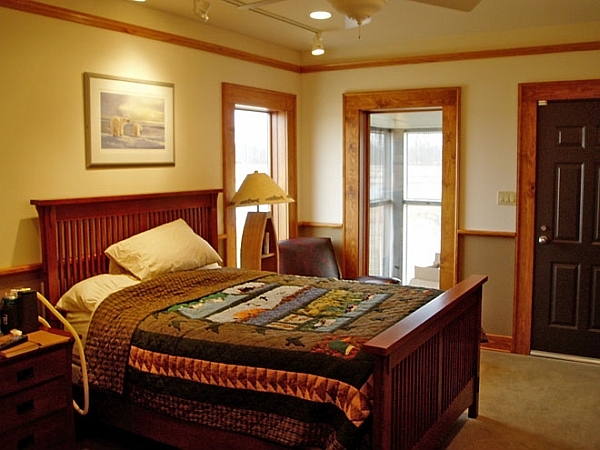 Why not finish this journey with a lovely structure that makes a cozy alpine chalet? 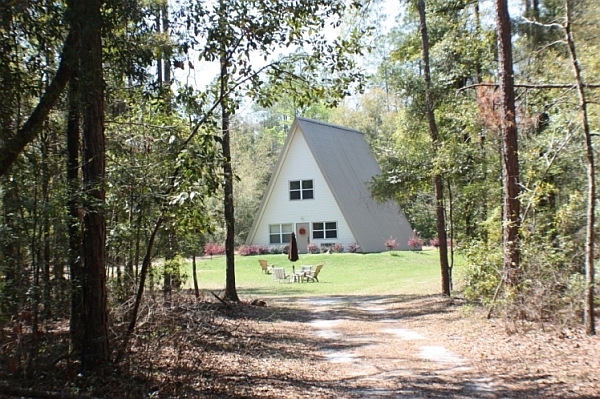 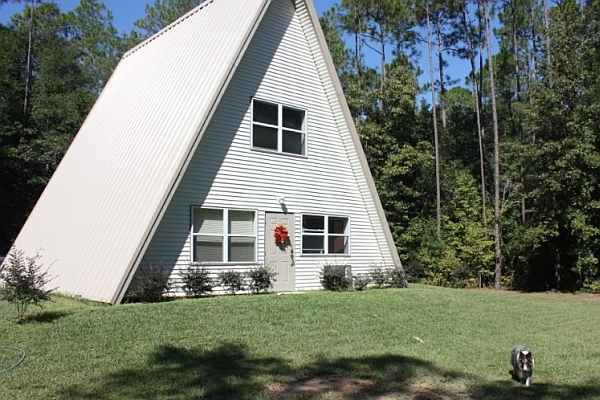 A-frame houses have a certain nostalgic charm about them that is undeniable. 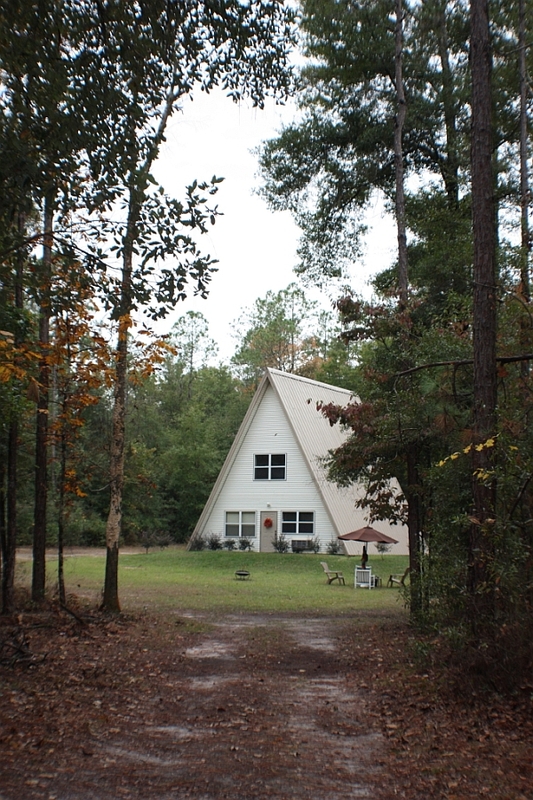 Incredibly popular during the post-World War II era, A-frame retreats take you back in time, thanks to their exceptional form. 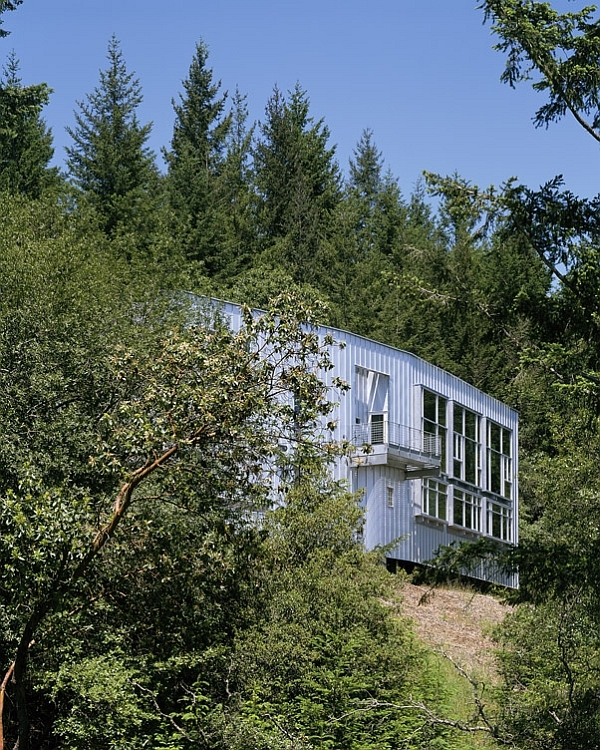 Built to handle heavy snow and strong winds, this steel-framed lakeside wonder seems to offer an idyllic getaway in the woods. 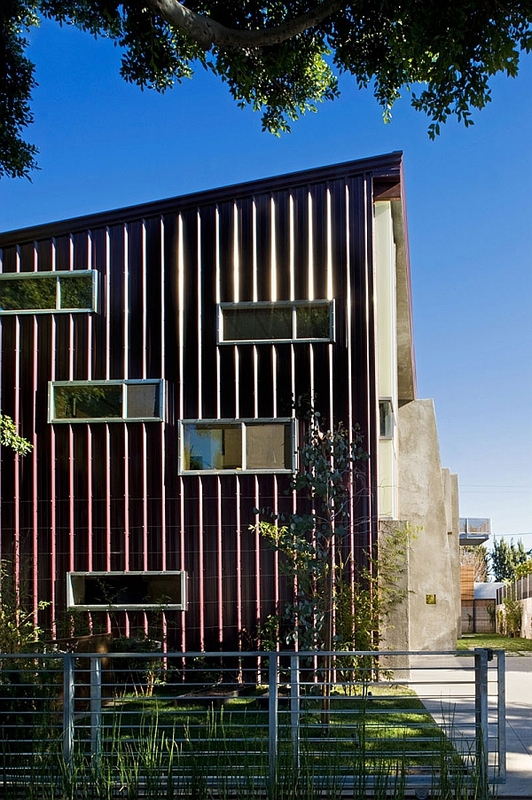 The many advantages of stunning steel-frame houses are being tapped into by architects across the globe to create a brand new trend in affordable and durable housing. 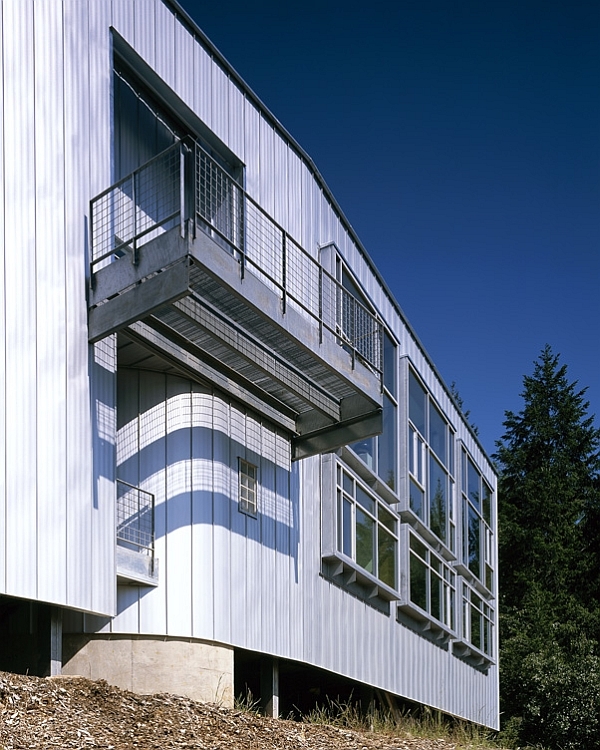 From withstanding natural disasters to presenting sustainable design options, prefabricated metallic frame structures are here to stay. 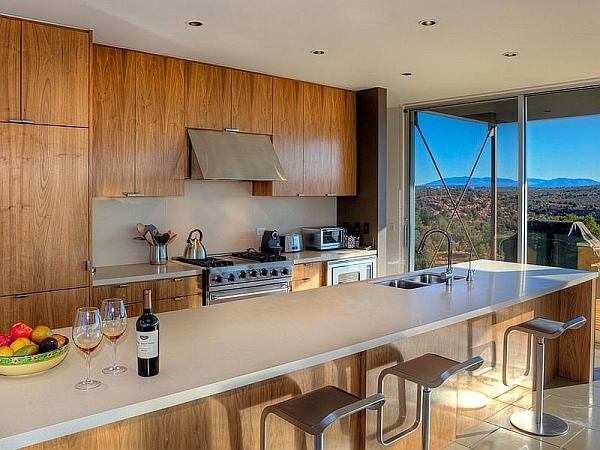 Are you ready to move away from the cookie-cutter homes?